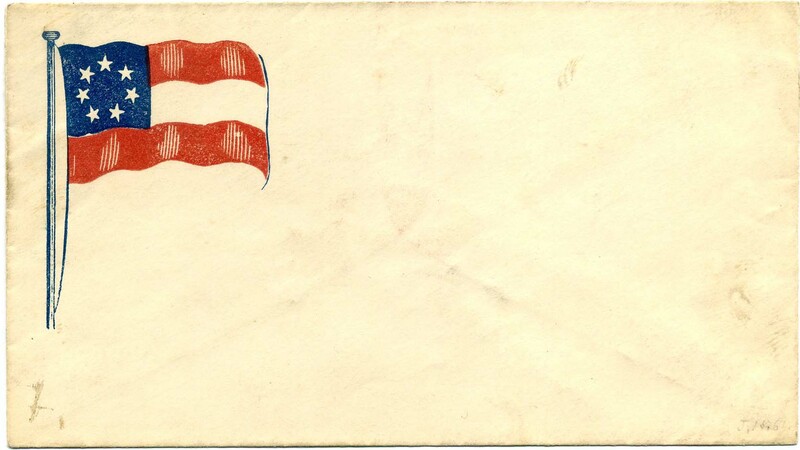 12-star flag and cannon, blue New Dietz type CN-1 with verse, bearing MEMPHIS / Ten. // Nov / 14 / (18)61 cds and DUE 5 with docketing from "Thos R. Taylor Co. B. 11th Ark Reg" to "Revd R. V. Taylor, Somerville, Tenn." with red crayon "X" at center, some soiling and missing part of top back flap otherwise Very Fine. 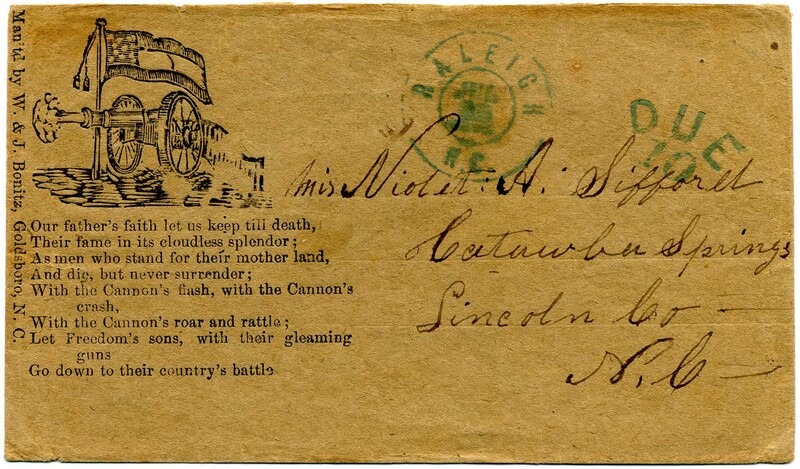 CSA 1, right margin 5¢ green, horizontal pair tied by faint Richmond, Va. cds on 11-Star Flag patriotic with verse and imprint (Dietz F11-16; 1-15), with "Jan 27, 62" pencil docketing at center, addressed to Athens, Ga., 1990 P.F. certificate. SCV $2,500, Ex Tate. $1,500. 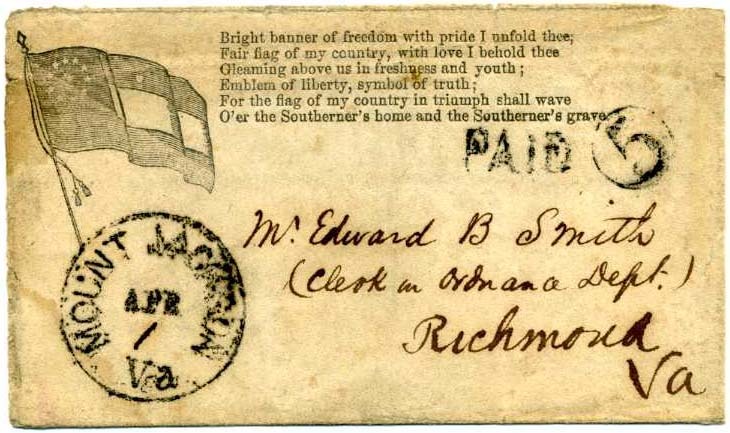 CSA 4, 4-margin 5¢ blue tied by partial Richmond, Va. cds on 11-Star Flag patriotic with verse and imprint (Dietz F11-16; 1-15), addressed to Whittle's Mill, Va., very scarce issue on patriotic. SCV $2,000, Ex Tate. $1,750. CSA 2 10¢ blue Hoyer & Ludwig print canceled blue July (1862) PETERSBURG / VA. cds on Two Unmounted Soldiers patriotic, Dietz type SN-1 with Bonitz Goldsboro imprint 10 and verse 11 “Men of the South, arise, arise_”, noted as only 10 of this design known and cataloging $800 in 1986. The cover catalogs $3,000 for a Hoyer on a patriotic in 2008 Scott. Stamp with pre-use tear and other small faults. 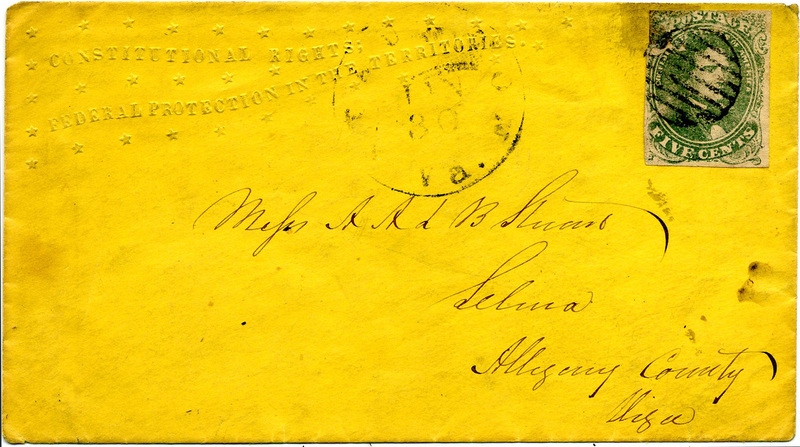 Cover is addressed to “Mrs Susan Blalock Hurdles Mills Person Co NC” from her husband. Small tear at top left. According to military records, Private Thomas Blalock was a 25 year-old farmer when he mustered into Company “A” of the 50th NC Infantry on April 21, 1862 and died of disease on May 26, 1863 in a NC hospital. The 50th NC was organized at Camp Mangum near Raleigh in April 1862 and during the summer of 1862 they saw action around Petersburg and Drewry’s Bluff; in 1863 they moved to NC in the areas of New Bern, Washington and Kinston. 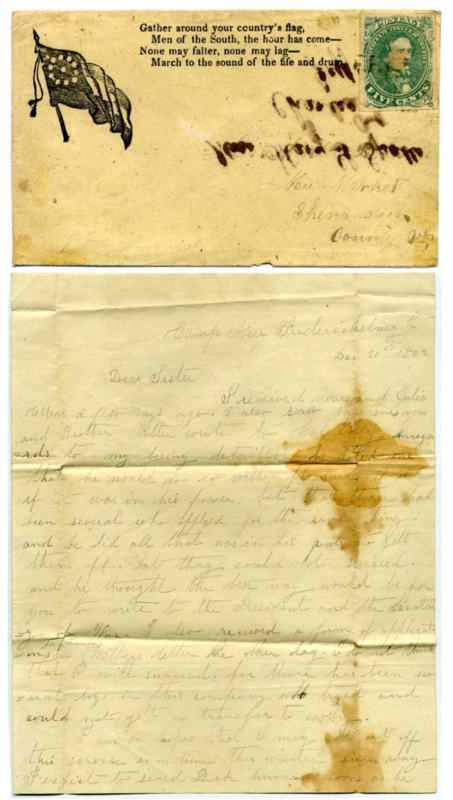 Original 2-page letter enclosed headed “July 19th 1862 Camp near Petersburg”. One side is a letter to his wife and the other side is to his mother mentioning “tyfoid feaver” (sic). CSA 2a, 10¢ light blue Paterson tied BEANS STATION / TEN cds over captured Union patriotic shield in star design (Weiss O-S 30/L-265), addressed to “P.M. White, Esq, Quincy, Florida,cover corners reinforced and stamp has been lifted and moved to the right to display the complete design. A lovely use. $1,450. 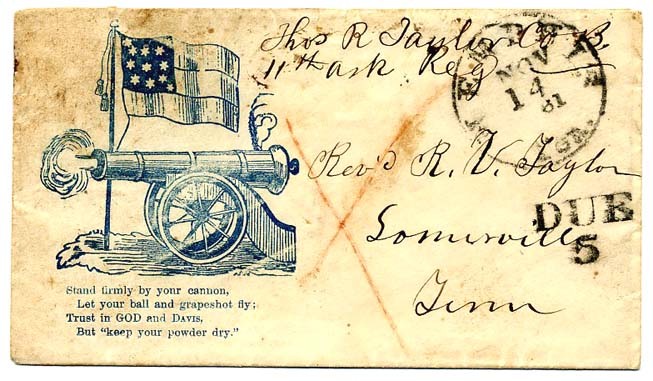 CSA 6, 5¢ blue pair (tiny fault at upper left) tied blue Petersburg, Va. cds on patriotic design of Cannon firing at an angle and elongated flag, type CN-3 with verse 4 and imprint 10 of Bonitz,Goldsboro, NC, addressed to Mrs. Susan Howard at Oxford, N.C. $900. ATHENS / Ga. cds with matching handstamped PAID 5 on rare 8-star flag waving around the staff topped with liberty cap, patriotic design type F8-7, addressed to Mr.Wm. G. Noble, Care Mr. John White, Warrenton, North Carolina, reduced bit at top with some edge wear and light staining at bottom. Great provenance of ex Walcott, Brooks, Kaplan and signed Dietz. CSA Catalog Value $3,500. $2,000. 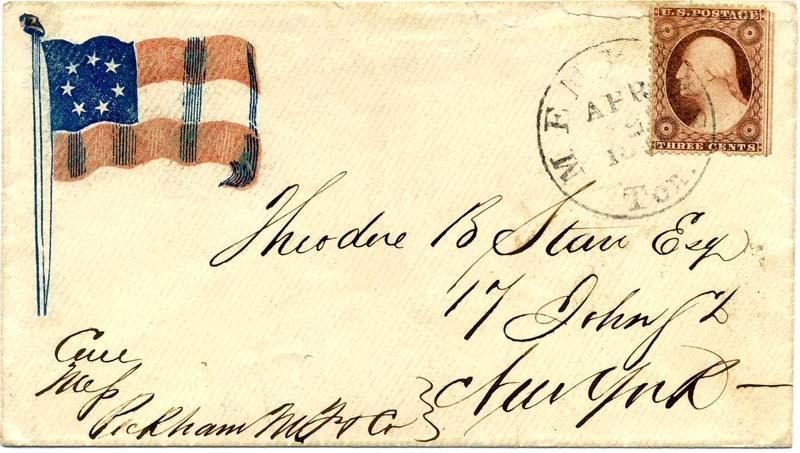 CSA 1, 5¢ green tied indistinguishable cancel which is purported by Van Dyk MacBride to be a straightline FREE cancel (I am not so guaranteeing, although it could be so) on turned cover with inside addressed and no doubt hand carried. On 11-star flag patriotic to New Market, Shenandoah County, Va with original letter headed “Camp Near Fredericksburg, Va., Dec 21st 1862” from “Your affection Brother W.C.C.” to his sister regarding the letters written to Col. Posey about him being detailed, but that there were others who had applied for the same thing and he thought the best way would be for her to write to the President and Secretary of War. Apparently he wants a transfer to the cavalry. Says he needs clothes for winter as is very cold (Dec 21st 1862) and he can scarcely write, but not worth her doing as winter will be over before he gets them. Letter transcription included. Date lends credence to the FREE handstamp as it was underpaid as the rate was 10¢ by then. Interesting item. $900. 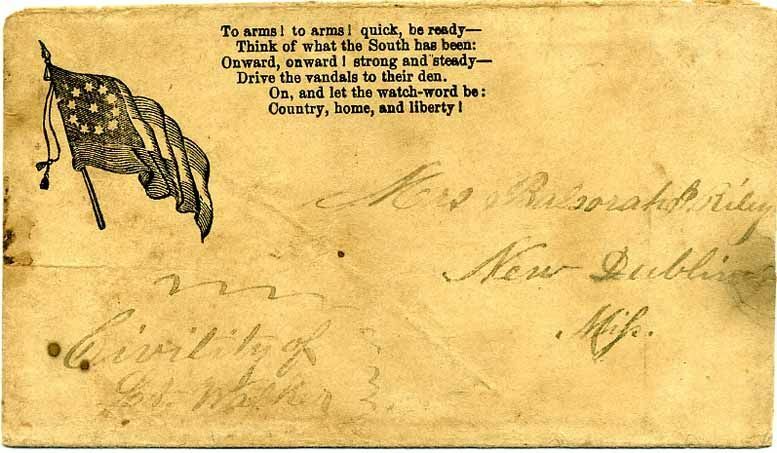 RICHMOND / Va. // JUL / 1 / 1862 cds with matching DUE 10 on captured Howell’s Poems Patriotic addressed to “Rev. F. R. Goulting (aka Goulding), Macon, Ga” with soldier’s endorsement of "Sergt C. H. Goulting, Co. B. 8th Geo[rgia]"; First Day of 10¢ rate – a pivotal date for any Confederate collection and on a captured Union patriotic to boot. Ex Powell with 1988 CSA certificate #01731. $2,000. Rev. Francis Robert Goulding (1810-1881) served as a chaplain during the war. His papers are at Emory University. C.H. Goulding is shown on the roster of Company B – Oglethorpe Light Infantry – Chatham County. 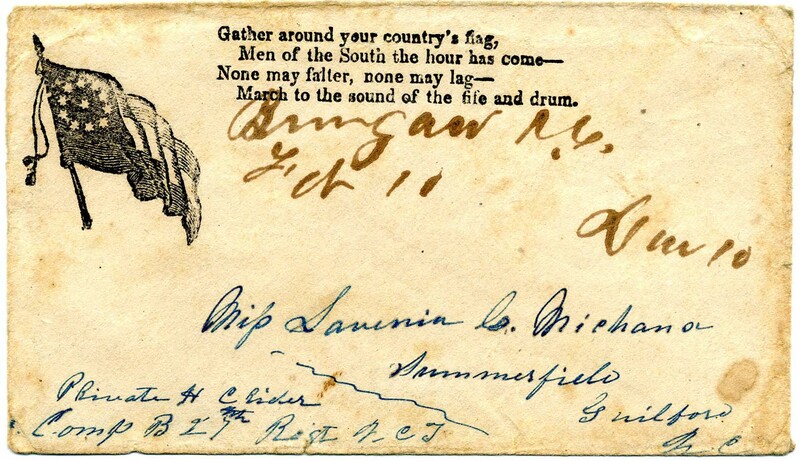 MOUNT JACKSON / Va. // APR / 1  cds with matching handstamped PAID 5 on scarce 11-star flag patriotic, type F11-17 with “Bright banner of freedom…” verse; addressed to “Mr. Edward B. Smith (Clerk in Ordnance Dept. ), Richmond, Va”, very slightly reduced at right, Ex Wm A Fox. $1,750. 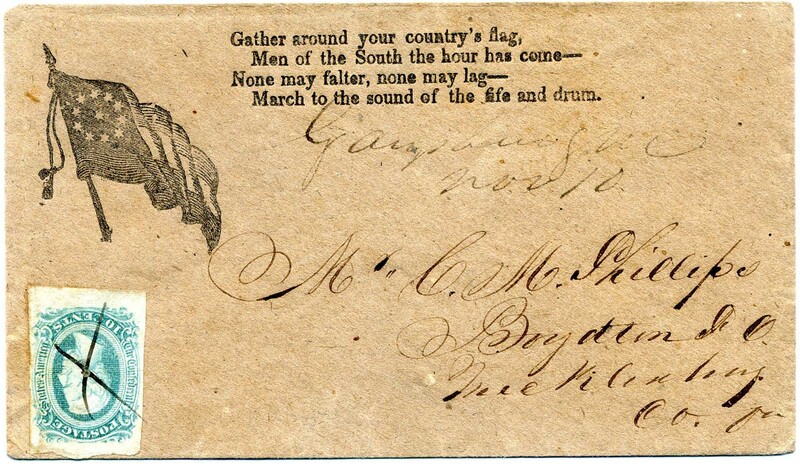 [Columbia / S.C.] blue [due] 10 on 11-star flag patriotic with faint penciled address and soldier’s endorsement at top right which I can not make out. 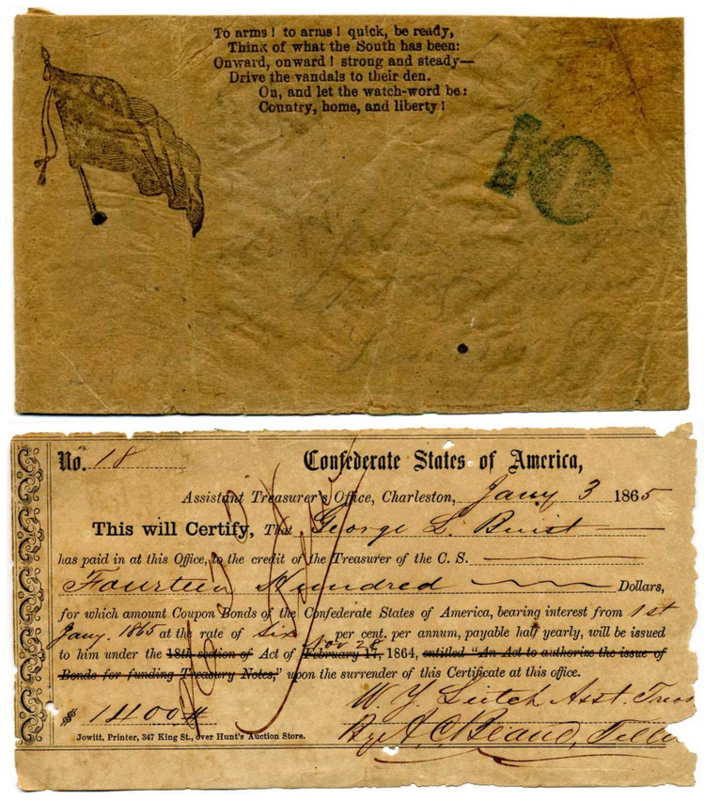 Enclosed is an elegant and interesting printed / filled out Confederate Assistant Treasurer’s Office, Charleston Jany 3 , 1865 dated receipt for $1,400 in Confederate coupon bonds. JACKSON / TEN. // JUL 2 /  neat CDS with matching handstamped PAID in arc and pencil "10" for double rate on red and blue 7-Star Confederate Flag Patriotic cover to Col. W. B. 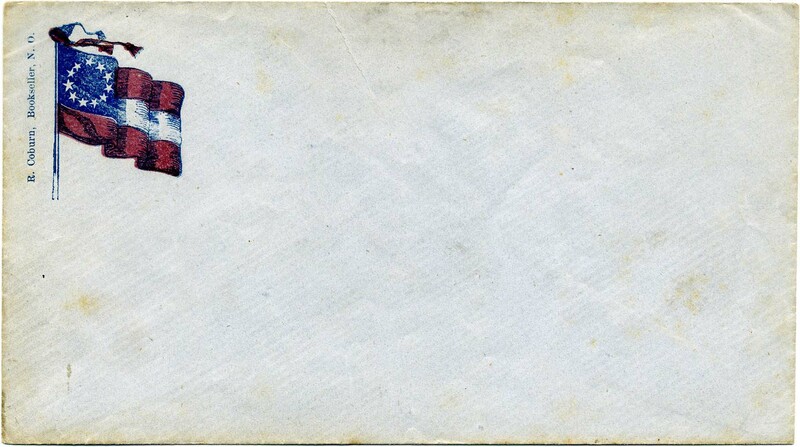 A. Ramsey, Nashville, Tenn., some light soiling and wear, small piece of back flap missing. Tennessee passed ordinances of secession on May 6, 1861 The Ordinance required that the question thereafter be submitted to a popular referendum. This occurred on June 8, 1861, when the Ordinance was approved. Tennessee was admitted as a Confederate state on July 2, 1861. 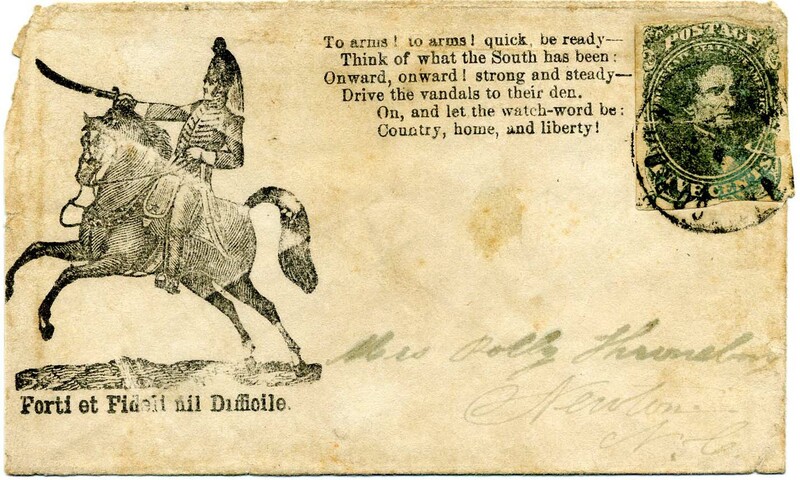 Nashville was occupied by Federal troops beginning in February 1862 so, while there is no year date on this cover, it is necessarily an 1861 use. First Day of Confederate Tennessee use, Ex Gallagher and Boshwit. Col. William Baine Alexander Ramsey was Tennessee’s Secretary of State 1847-55; he was born in Knox County Tenn Feb. 4, 1799 and died in Edgefield Tenn Apr. 27, 1874. $2,500. 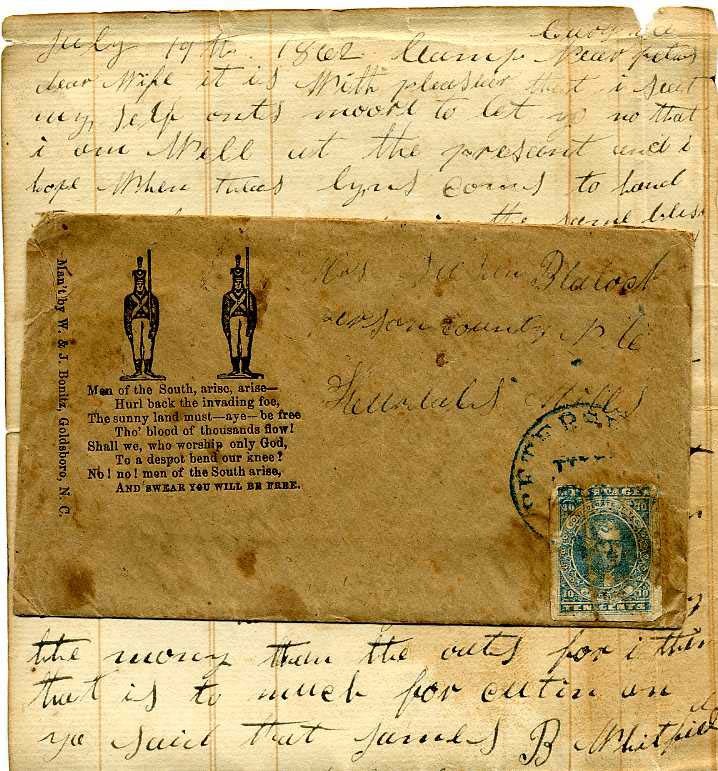 WINCHESTER / Va. // OCT / 26 CDS with handstamps DUE and 10 on red Gen. Beauregard Patriotic cover to Palmetto Ga., soldier's endorsement of W. H. C. Davenport 35th Ga. Regt to Mr. Wm. Davenport Palmetto, Georgia; cleaned and repaired at top right into the cancel, Very Fine appearance; ex Agre, with old 1991 C.S.A. certificate #02217 not mentioning restoration.$1,000. 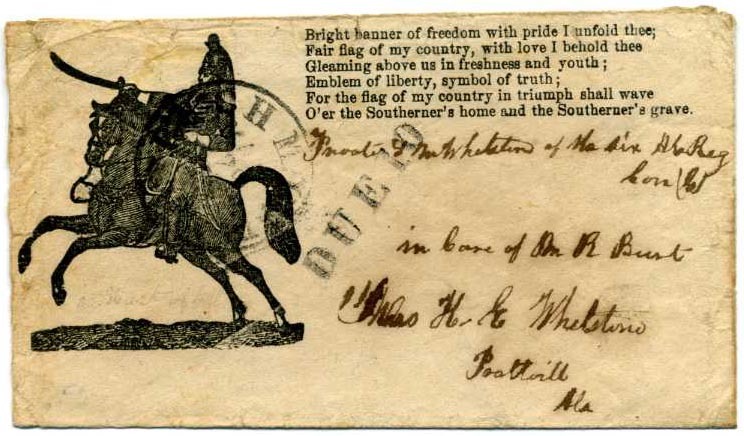 RICHMOND / Va. // Max // 29 cds with matching DUE 10 straightline on large mounted dragoon patriotic with verse beginning “Bright banner of freedom…”, addressed to Mrs. H. E. Whetstone, Prattville Ala with endorsement Private L M Whetstone of the Six Ala Reg Com G. [“Autauga Rifles” Army of Northern Virginia] $1,000. Lewis M. Whetstone, Jr. (1838-1862) was in the 6th Alabama. COLUMBIA / S.C. // JUN / 15 blue cds with matching PAID 5 on 7-STAR FLAG PATRIOTIC, CC F7-18, addressed in peacock blue ink to Mrs. Christana McArthur, Glenn Springs, SC. $1,100. 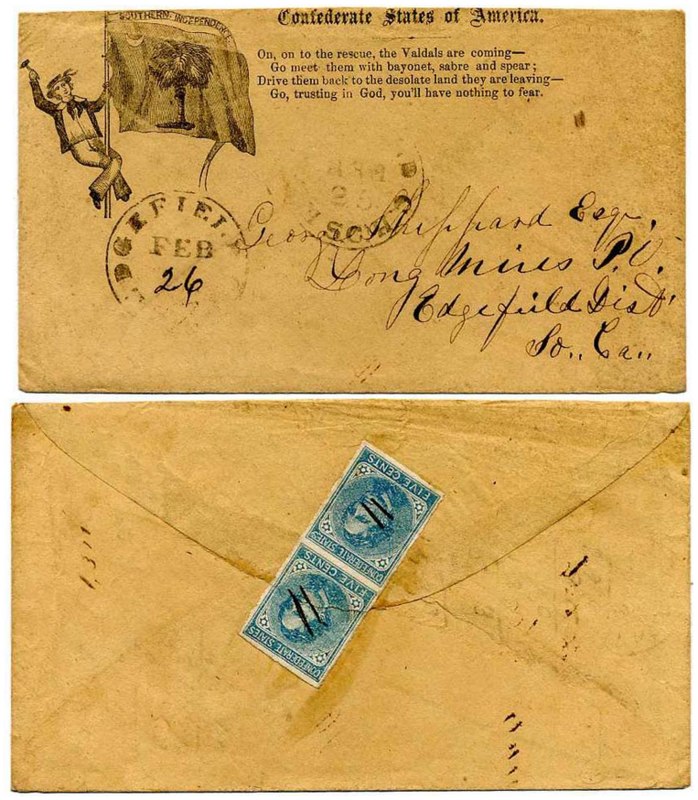 CSA 7-R, 5¢ blue vertical pair used on back flaps cancelled by pen strokes (top stamp split from opening) with double strike of EDGEFIELD C.H. 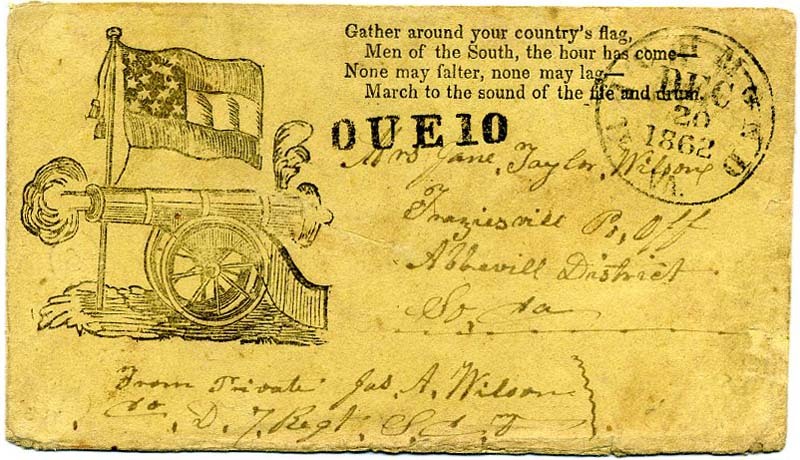 / S.C. // FEB / 26 cds on Sailor Nailing Palmetto Flag to the Mast With Streaming "Southern Independence" Banner patriotic with "On, on to the rescue, the Valdals are coming" verse (vandals misspelled), CC type FSC 2, addressed to George Sheppard Esqr, Long Mires PO, So Ca. Scarce Palmetto Flag patriotic design, a beauty! CCV $3,500. $3,500. 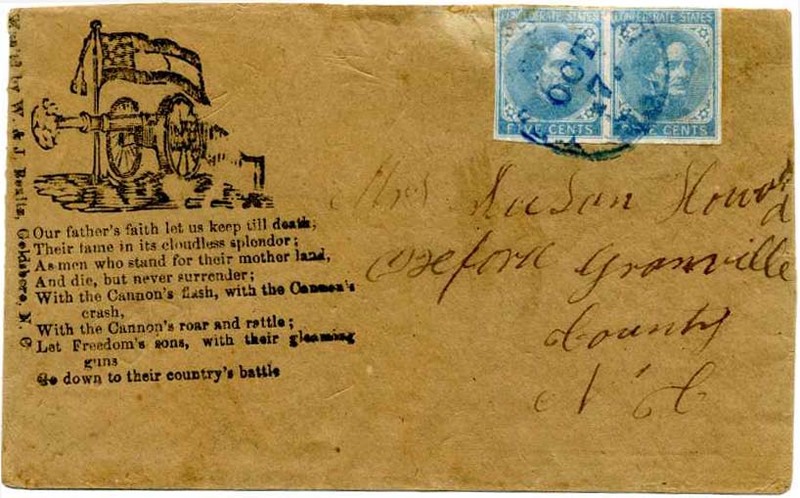 CSA 7-R, 5¢ blue local pair (tiny faults) tied tied DUBLIN [VA] on 11-star flag patriotic with verse printed slightly askew, addressed to Mrs. Delilah Henderson, McDonalds Mills, Va.; offset of the same patriotic image on back flaps. $500. 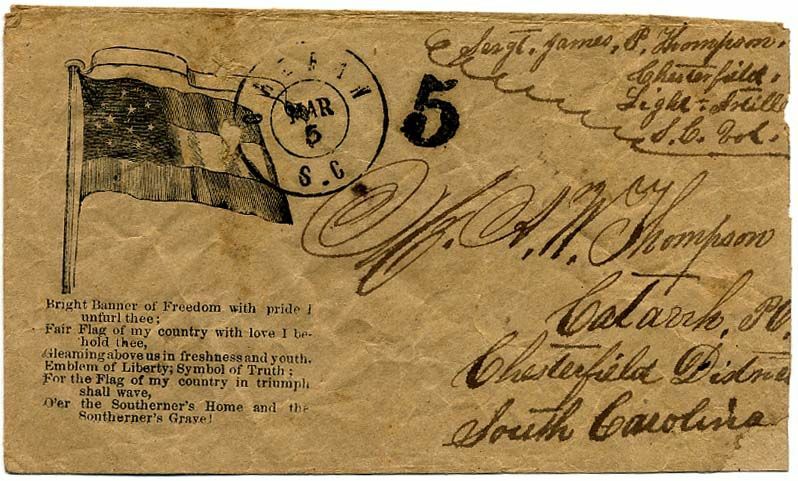 CHERAW / S.C. // MAR / 5  bold double-circle datestamp with matching [DUE] "5" handstamp on 10-Star Confederate Flag and Verse Patriotic (CSA Catalog F10-11, Verse 5, with CV $1,000) to A. W. Thompson, Catarrh, S.C., endorsed by Sergt. James P[arker] Thompson of Chesterfield Light Artillery, S.C. Vol., (James C. Coit’s Company), slightly reduced at right and some small edge repairs, small erosion out of design.Later shown in records as 1st Lieut, Army of Northern Virginia $1,200. Handcarried "Civility of Lt. Walker" manuscript endorsement at lower left of 11-Star Confederate Flag and Verse Patriotic (CSA Catalog F-11-16, Verse 45) to Mrs. Balsorah P. Riley, New Dublin Miss., few edge flaws and soiling, otherwise Fine; sent by her brother-in-law E. M. Riley of the 39th Miss., Sear's Brigade, French's Division, Polk's Corps. Original enclosure not with the cover but prior owner indicates from whom and that it was headed from the battlefield at New Hope, 15 miles west of Marietta, GA. $400. CSA 7-R, 5¢ blue pair used with pen slash, no town marking, on patriotic with verse and Bonitz imprint to Friendship, NC; it is likely the stamps were added, sold “as is”. $300. 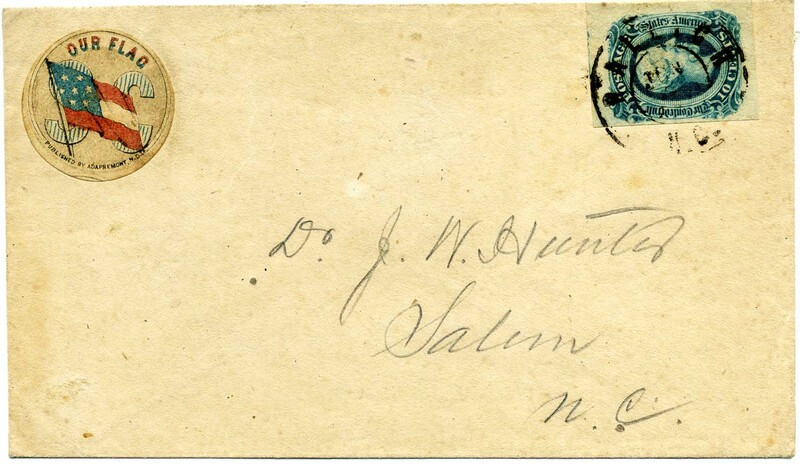 CSA 7-R-v2, 5¢ blue pair, variety with frame line filled in at right (small faults) with indistinct cds which prior owner tagged as Guiney’s VA and I believe may be Orange C.H., VA (leave you to decide), used on small piece of a Confederate patriotic cover with verse beginning “Gather around your country’s flag, Men of the South…” Too bad it’s not the whole cover! Lame brain collector or correspondent of old. Ex Powell. $250. CSA 4, 5¢ dark blue pair (couple pre-use creases) tied Richmond, Va May 26, 1862 cds, Powell Type 3, on piece of 11-star patriotic with verse “To arms! To Arms! Quick, be ready_”, Ex Powell. $350. 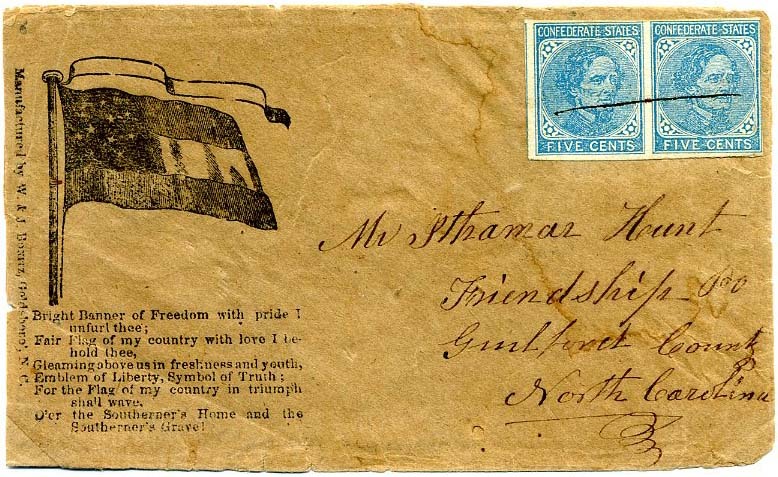 CSA 7-R-v2, 5¢ blue (2 singles) left one with filled in frame variety, other regular local issue, tied bold neat Richmond, Va. // Jun 1863 cds on piece of captured Union patriotic of eagle, shield and banner “Union Forever”. Ex Powell. $350. 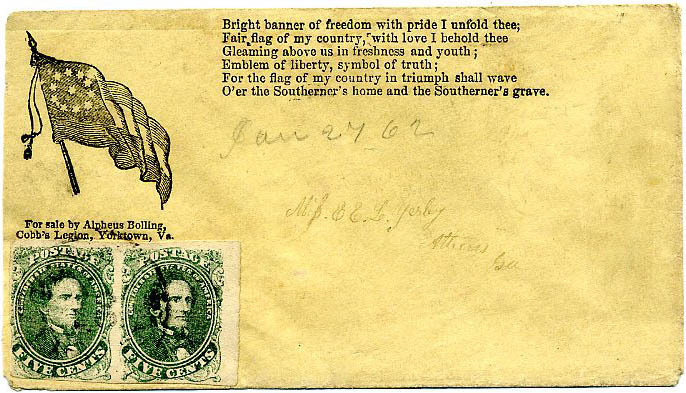 CSA 1, 5¢ bright green canceled by socked-on-the-nose 7-bar field grid handstamp used on 11-Star Flag, patriotic with slogan, verse and J.W. 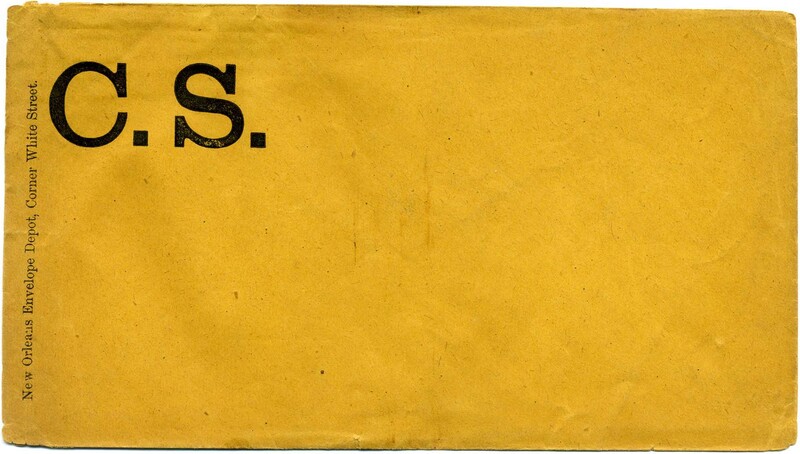 Randolph imprint (CSA Catalog F11-16) to Miss Ellen L. Jones, Pedlars Mills, Va., small sealed cover tear at left into imprint otherwise Very Fine, 2014 SCV $2,500, Ex Tate. 2014 PF Certificate declining opinion as to whether stamp originated, as is common for untied stamps but is clearly contemporaneously addressed with no evidence of being hand-carried such as "politeness of." $1,250. CSA 1, 5¢ green tied by LAGRANGE / GA // MAY / 6  cds on cover to Miss E. J. Elkins, Griffin Ga. with John Bell Three-Quarter Portrait with Flags, Eagle and Shield, Raynor imprint, Milgram JBL-14, slightly reduced at right. 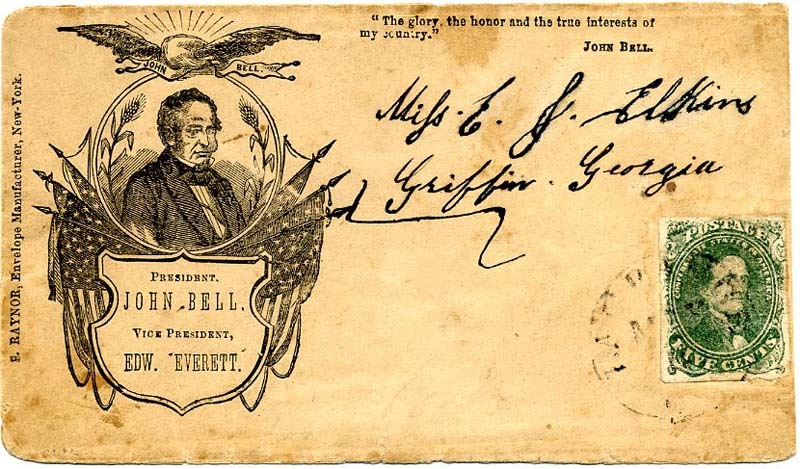 An extremely rare John Bell 1860 campaign cover used within the Confederate postal system. Ex White and Shenfield. $4,250. John Bell was a prominent politician from Tennessee. 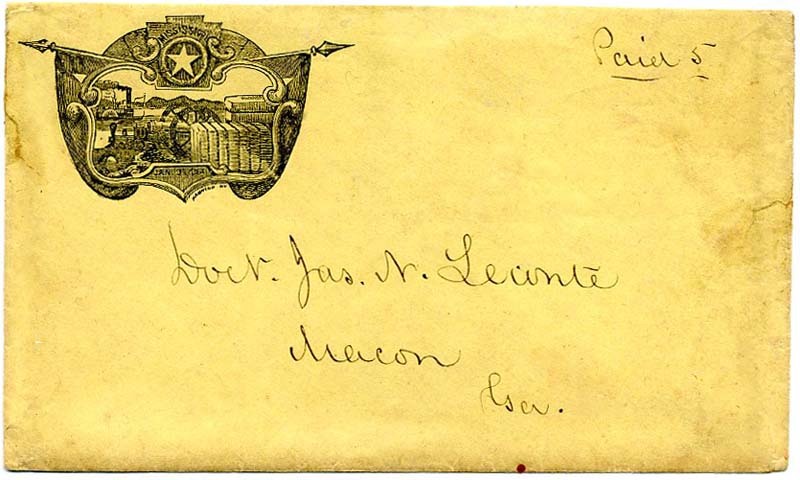 [Nickajack, Tenn] manuscript "Paid 5" on Mississippi Confederate State Seal patriotic cover with Jan. 9, 1861 at the bottom of the elaborate design depicting riverboat and industry (FM-1), Hammond imprint, to Doct Jas. 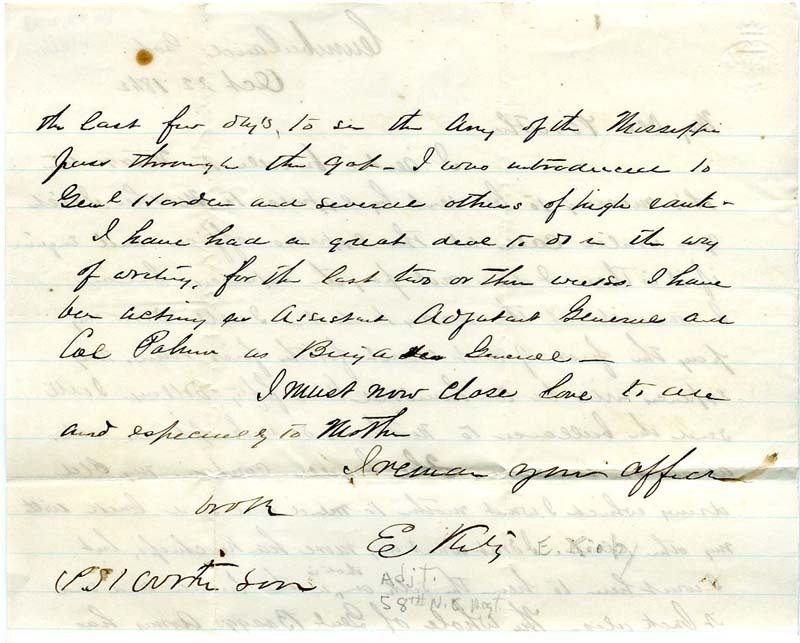 N. LeConte, Macon Ga., with original letter signed Hargrove Hinkley datelined "Nickajack [Tenn]March 26, 1862." 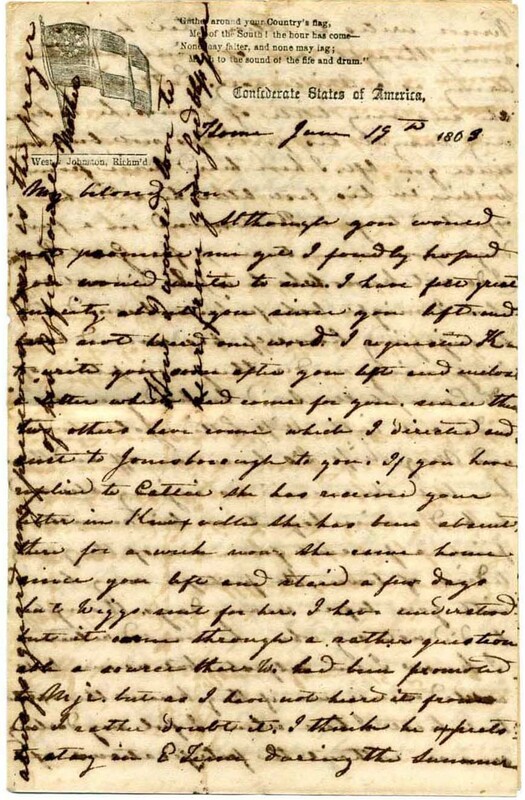 Excellent letter content in beautiful strong and legible hand which mentions, in part, “Yankee Army some 12,000 or more strong is some 30 or 40 miles from us coming over the Cumberland mountains, it may not be amiss to say to you that as I have no interest in swearing allegiance to the infernal Lincoln Government of letting them steal, free or hire out the negroes on this plantation. I shall, should they come to Shellmound, Bridgeport or Stevenson, as is probably their intention, take my family and the Negroes into Georgia out of harm’s way. “ Much more excellent content. 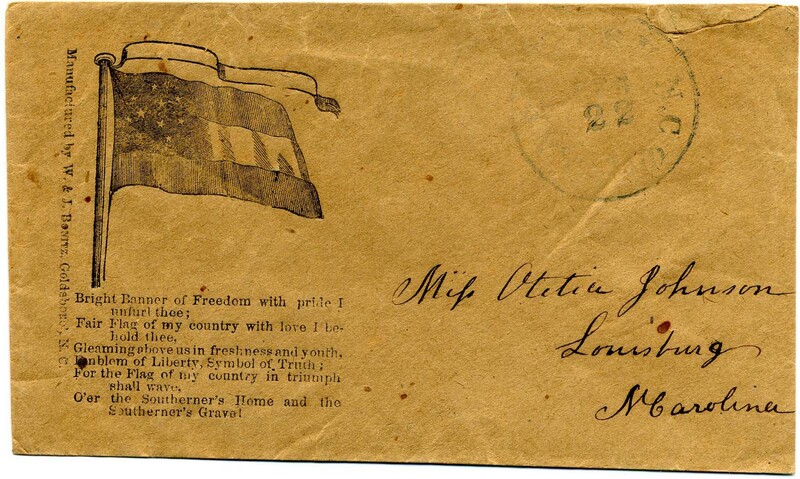 Cover missing top flap some sealed edge tears, a rare and attractive design commemorating the date Mississippi seceded from the Union. Letter dated April 1972 from Billy Matz to Dan Gilbert regarding this cover, saying that LeConte was teaching college in Macon at this time. CSA Catalog Value $3,500, Ex Gilbert. $2,000. Dr. James Nisbet "Jimmer" LeConte (1834-1862) was born at Cedar Hill Plantation in Liberty County, GA. He graduated from Franklin College (University of Georgia) in 1853 as well as Jefferson Medical College of Philadelphia, PA. In 1858, he settled in Rome, GA to practice medicine. On April 22, 1858, he married Mary B. Gordon of Columbia, TN. On July 13, 1862, he died of tuberculosis at the age of 28 years. US 26, 3¢ dull red (replaced piece at top) tied neat MEMPHIS / Ten. 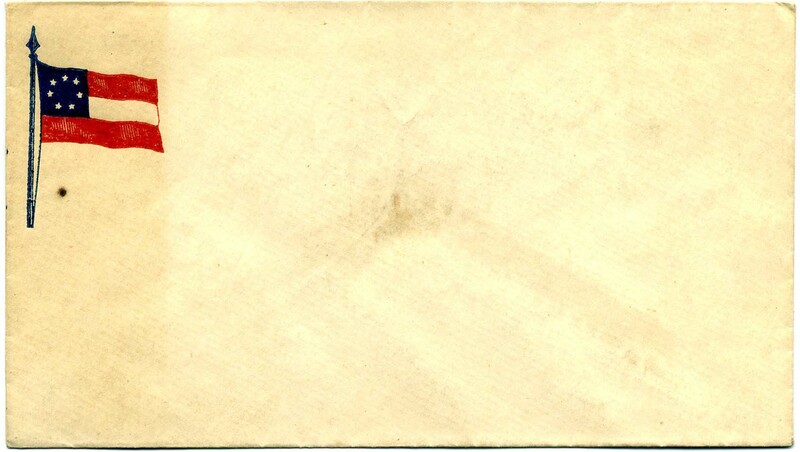 // APR / 5 (inverted) / 1861 cds on clean early use of a pre-secession Confederate 7-star patriotic cover (CSA Catalog F7-5C, CCV $2,500) addressed to Theodore B. Starr, 17 John Street, New York Care Messrs Peckham Mfg. & Co. Sealed tears / small restored piece at top under stamp, flap tears. Ex Boshwit in his impressive Tennessee collection. This is featured in my June 2015 column in The American Stamp Dealer & Collector. $1,400. Theodore Burr Starr (1837-1907) first opened his luxury retail business in 1862 and two years later partnered with Herman Marcus and became Starr & Marcus at the 17 John Street address from 1864-1877. The firm was the exclusive retail outlet for Gorham silver in New York. Their fine jewelry is still much sought after. Marcus eventually left the firm to return to former employer Tiffany & Co. while Starr continued as a jeweler, importer and merchant from 1877-1900 as Theodore B. Starr & Co. with a shop at 206 Fifth Avenue. In 1907, Starr's son incorporated the business. On July 1, 1918, their stock was purchased by the silver firm of Reed and Barton. The firm maintained a shop at 47th Street and Fifth Avenue. In 1923, Theodore B. Starr finally closed its doors. 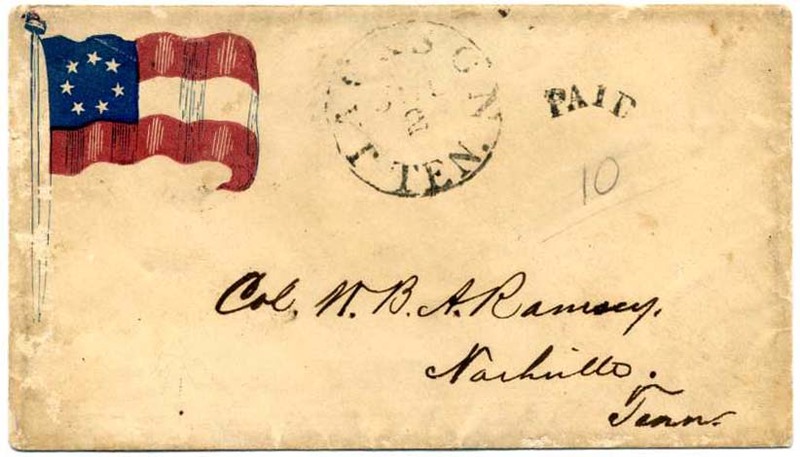 RICHMOND / VA // DEC / 20 / 1862 neat cds and matching DUE 10 on Cannon & 12-star Flag patriotic (CSA Catalog CN-1C) addressed to Mrs. Jane Taylor Wilson, Fraziersville P. Off., So. Ca; endorsed by Private Jas. A[lbert] Wilson, Co. D, 7 Regt S.C.T. (South Carolina Troops – Bonham’s / Kershaw’s Brigade, Van Dorn’s / Early’s Division, 1st Corps, Department of Northern Virginia, Potomac District) Back flap sealed tear, 2011 CSA Certificate #05623, Ex Bogg, Matz, Powell, Smith. $900. YORKTOWN / VA cds with manuscript [Due] 10 on 10-star patriotic cover with two white spots which may represent two stars for states – not commonly seen - (CSA Catalog F10-3) endorsed by Capt. 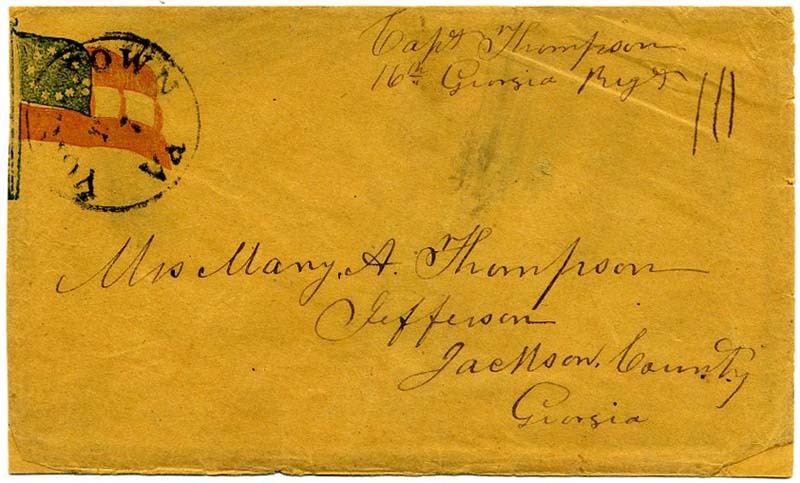 Thompson, 16th Georgia Regt; addressed to Mrs. Mary A. Thompson, Jefferson, Georgia, with original lengthy soldier’s camp letter to his wife concerning building winter quarter, skirmish near [Big] Bethel, and more. 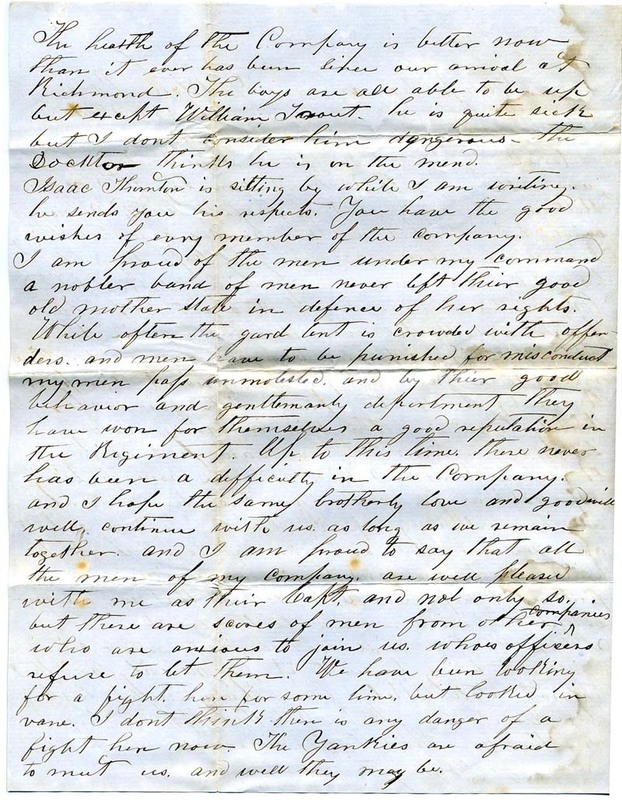 Fully typed transcript of the letter as well as historical background of the unit is included. Cover slightly reduced at left with small lower corner repairs, Very Fine appearance. $1,400. Capt. Augustus C. Thompson was in Co. G. 16th Georgia Infantry. He was wounded at Crampton’s Gap, MD, 14 Sept 1862 and resigned 1 August 1864, presumably because of his wound. 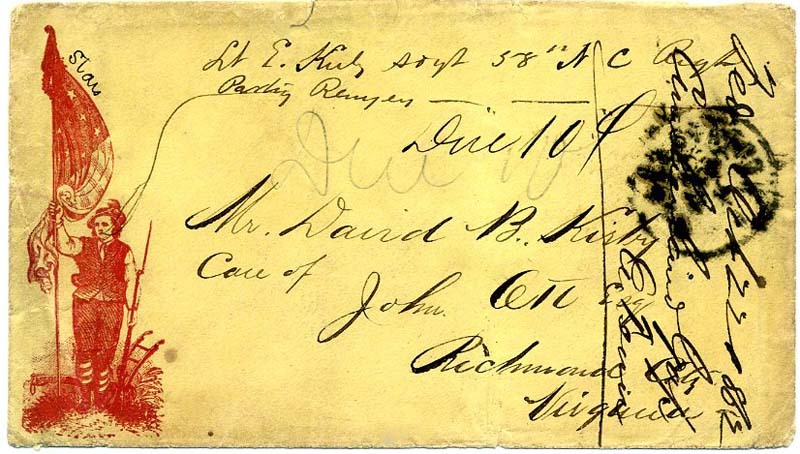 BEANS STATION / TEN // OCT // 22 / 1862 cds with manuscript “Due 10¢”in both pen and pencil, endorsed by Lt. E. Kirby, Adgt 58th NC Regt Partisan Rangers, on CAPTURED UNION PATRIOTIC to officer’s brother, David B. Kirby, Care of John Ott, Esq, Richmond City, Virginia. 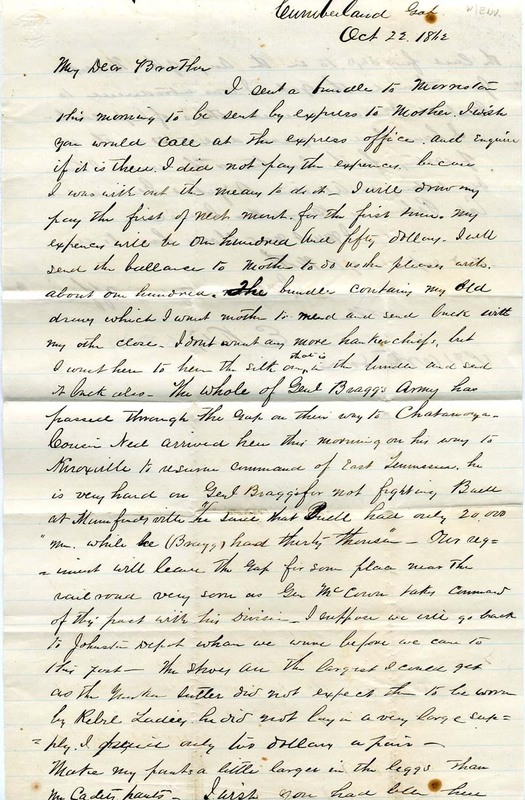 Original letter headed “Cumberland Gap, Oct 22, 1862” signed E. Kirby who was the adjutant of the 58th NC Partisan Rangers. Full typed transcription included. In part, he says, “The whole of Genl Bragg’s Army has passed through the Gap on their way to Chattanooga – Cousin Ned arrived here this morning on his way to Knoxville to resume command of East Tennessee, he is very hard on Genl Bragg for not fighting Buell at Mumfordsville he said that Buell had only 20,000 men while he (Bragg) had thirty thousand. Our Regt will leave the Gap for somewhere near the railroad very soon as Gen McCown takes command of this post with his division. I suppose we will go back to Johnston Depot where we were before we come to this post…I have been acting as Assistant Adjutant General and Col. Palmer as Brigade General.” Much more of interest. Back flap tears extending slightly over the top. 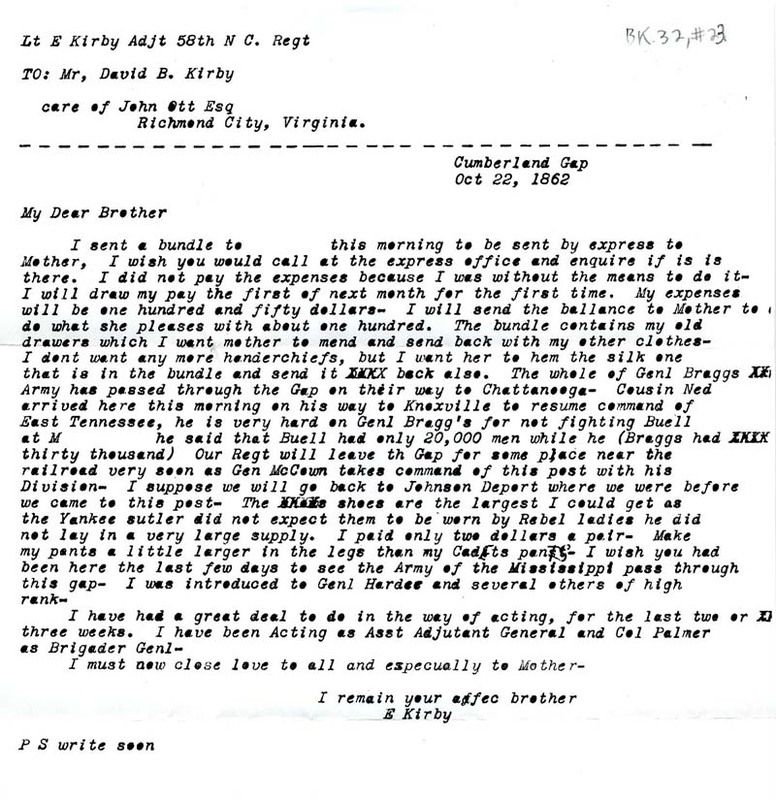 At the time, the 58th was in Gracie’s Brigade, Heth’s Division, Department of East Tennessee. 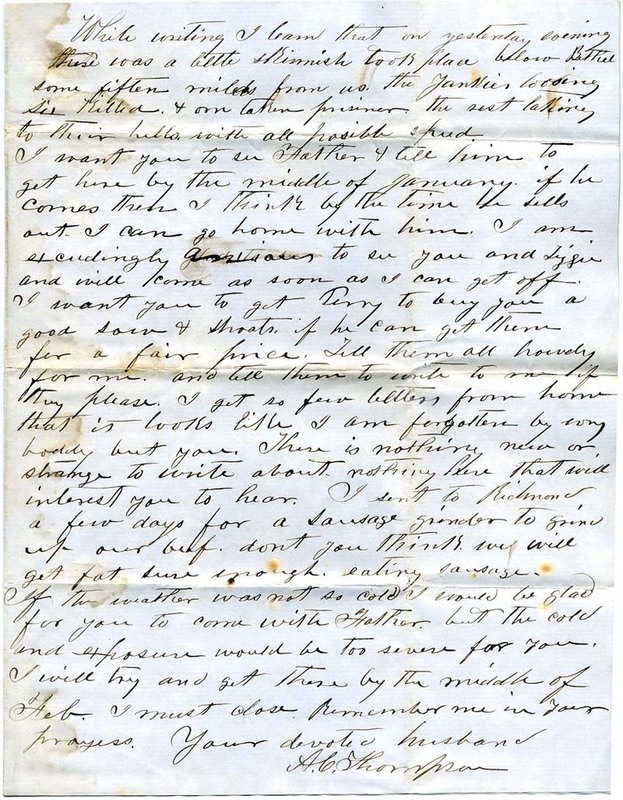 The letter was too long for the scanner bed – although appears cut off top and bottom, that is only the digital image, not the letter itself. Also, the second page is digitally cropped to a half page. $1,800. Lt. Col. Edmund Kirby served in the Field & Staff of the 58th NC Partisan Rangers Infantry. 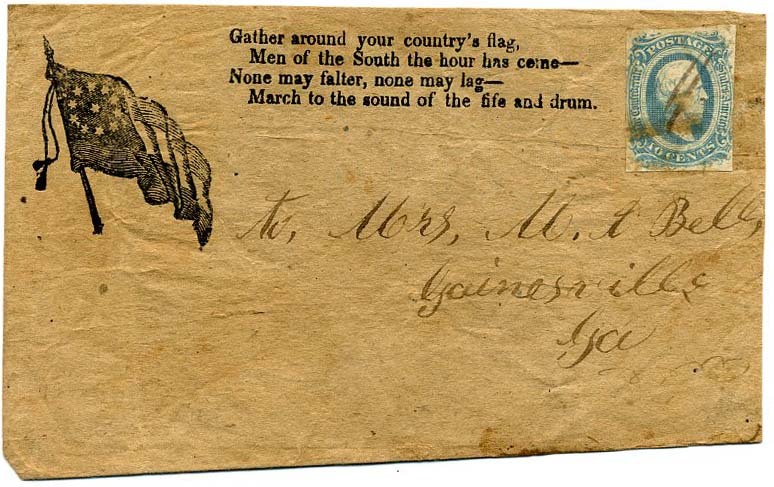 CSA 11, 10¢ blue used with pen cancel on 11-star flag patriotic (CSA Catalog F11-16 with verse 13, “Gather around your country’s flag…” addressed to Mrs. M. D. Bell, Gainesville Ga, design and verse offset on back flaps, matching cover with tied stamp from same correspondence in H.C. Brooks 1943 auction, lot 399, Dietz signature indicating he felt it was genuine use. $350. 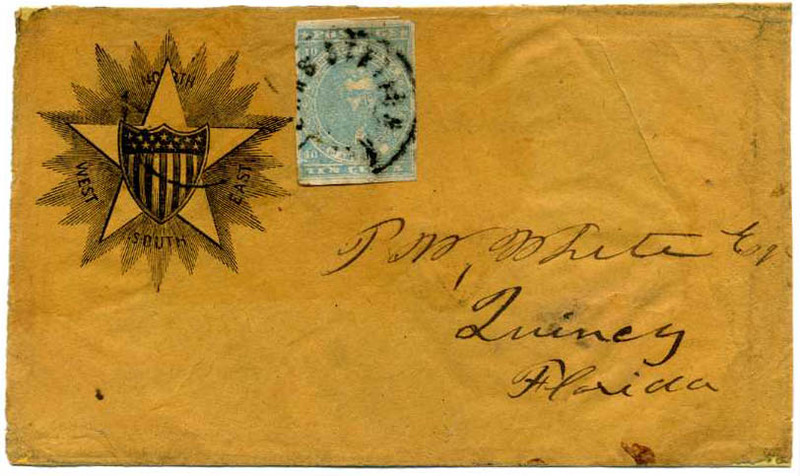 Charleston, SC, 5¢ blue, Type J, #16X1, vermin nibbles in the margins, tied by CHARLESTON / S.C. // JUN / 19 / 1862 dcds on UNLISTED 8-STAR PATRIOTIC with same design as CSA Catalog #F7-19 except with star added at center. 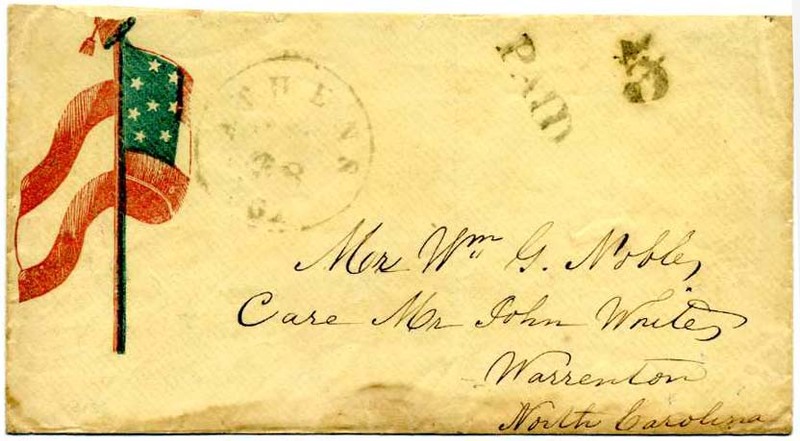 Addressed to Mrs. Martha Warnor (sic), Pleasant Lane, Edgefield Dist. S.C. Lightly cleaned, sealed flap tears. 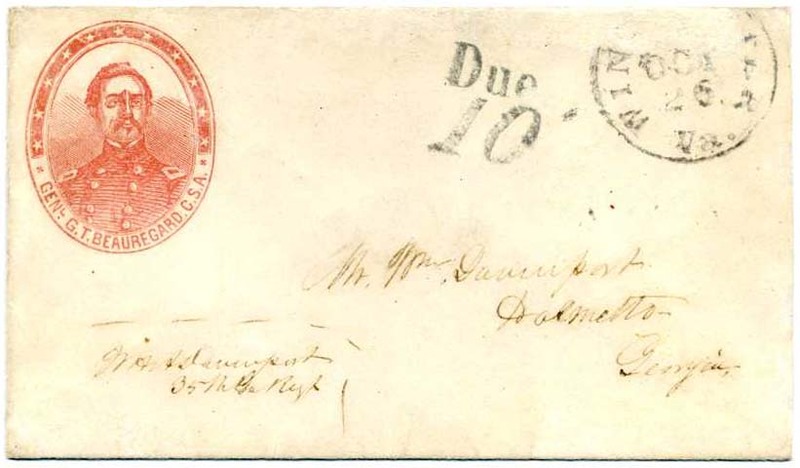 One of only two recorded examples of a Charleston provisional used on a patriotic cover. This late use of the Charleston postmaster provisional stamp was used just 11 days prior to the general postage rate increase to a standard 10¢ regardless of distance. 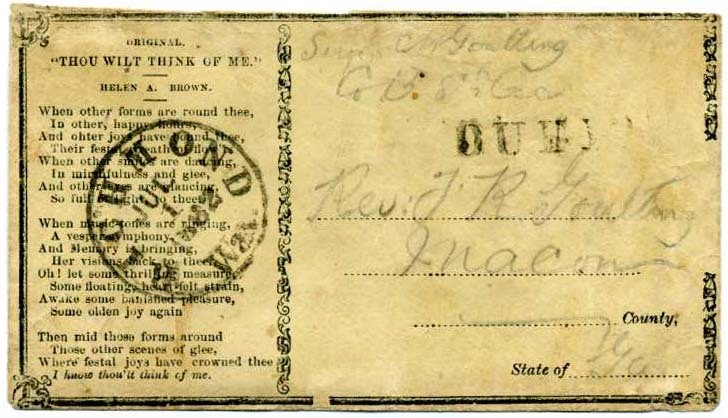 Apparently due to a temporary shortage of Confederate stamps in Charleston at this time, Postmaster Huger brought out supplies of the now obsolete provisionals and placed them on sale. Ex Holleman. SCV $11,500. $7,500. 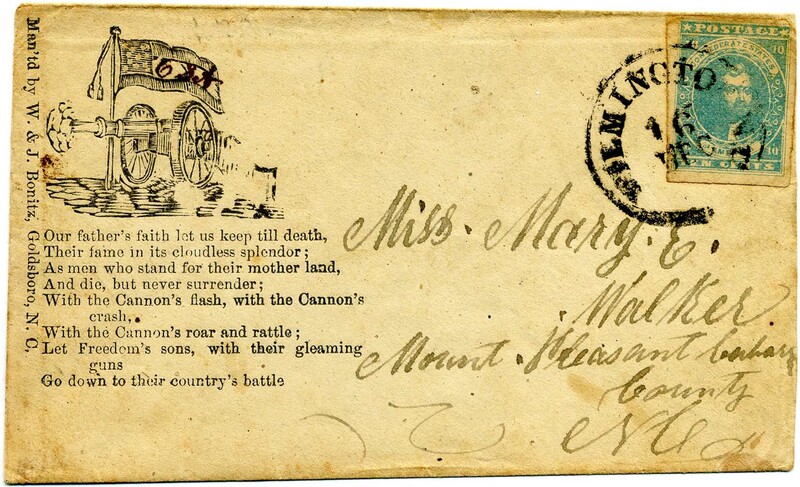 YORKTOWN / Va. // DEC / 11 cds with matching PAID 10 on Large Mounted Dragoon with raised saber (CC type SM-1, CV $1,000) with verse and slogan, addressed to Miss M. C. New, Pendleton, S.C., cover professionally restored. Ex Plantation Collection. $400. 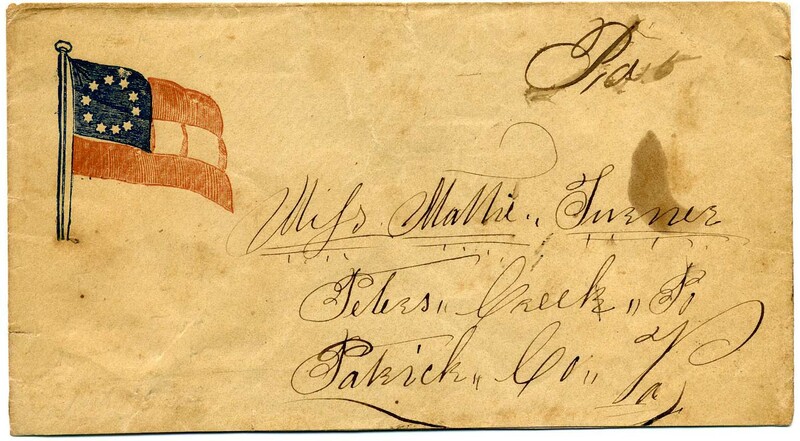 11-star patriotic (CC type F11-21, CV $10,000), handcarried to William C. Walker, Cross Rocks, Tenn. With ORIGINAL LETTER headed “Bowling Green Ky Oct 19th 1861” from his brother, W. B. H. Walker. The large star in this rare patriotic represents Tennessee. Walker says that [General] Breckinridge “is now in our midst; he had to flee from home & his family to avoid being seized carried away captive & confined in some Northern prison. I sent you a Louisville courier by Mr. Clifton which I want you to be certain to get as an address of his to the people of Ky is in it which I want you to read & Mother especially. It breathes so much the spirit of a patriotic gentleman he is a fine looking man in appearance. I have seen Gen. Buckner also Gen. Johnson is here to chief comm. We are still fortifying here…you can send your letters by mail now if you can get no other way of conveyance…tell them to write to me by mail & direct to Capt. Bandy’s Co 18th Reg Tenn. Vol.” This went through Kaufmann Auctions “back in the day” but I am unsure which sale. A lovely and rare duo. Ex Plantation Collection. $4,000. W. B. H. Walker served in Capt. Wm. P. Bandy’s Company K, 18th Regt Tennessee Volunteers. 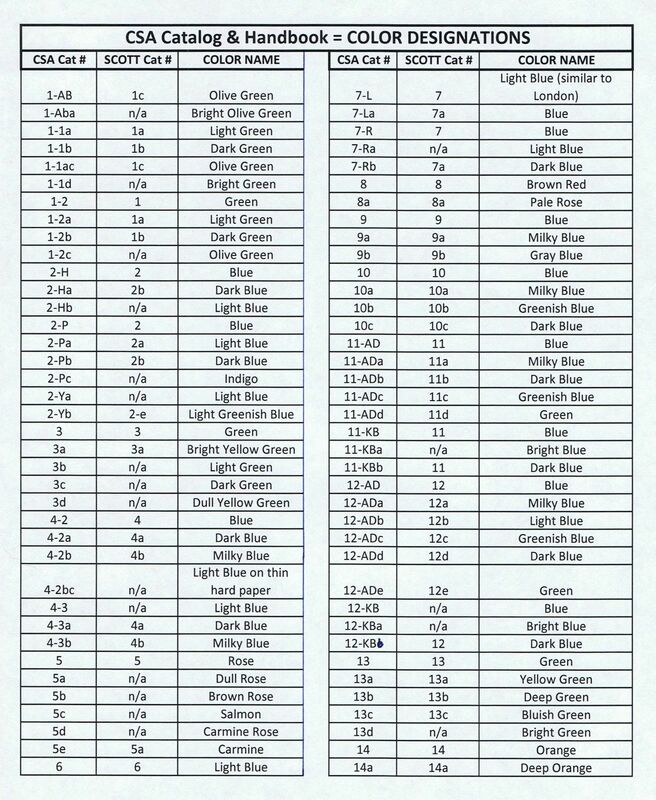 Much more detailed information on linked page. 7-star flag patriotic, unused (CC type F7-5B, CCV as used $5,000), slightest soiling, still Very Fine. Plantation Collection. $180. 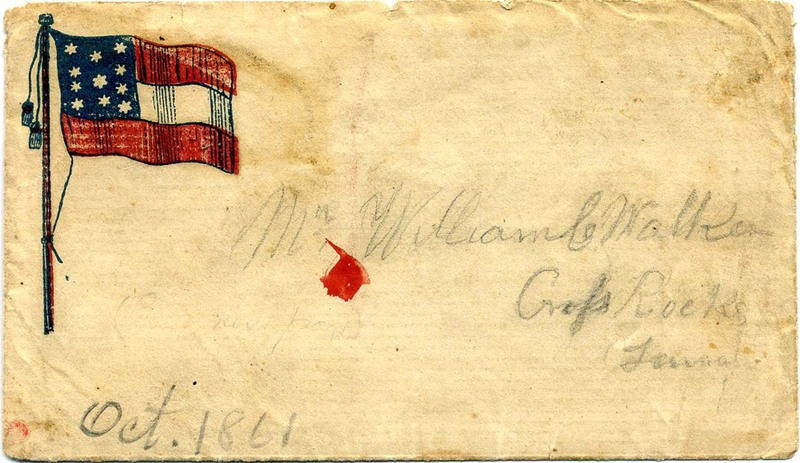 TUDOR HALL / Va. // 1862 cds partially struck off top of cover with matching DUE 10 on 11-star flag patriotic (CC type F11-16, CCV $750), addressed to W. H. McElween, Kingstree, SC, with soldier’s endorsement R. S. Smith Comp. C, 9th Regt. SC Vols. Bit reduced at top with tiny edge tears and part of top back flap missing. The 9th Infantry Regiment was organized in April 1861, for a term of one year's service. The unit was sent to Virginia and assigned to General D.R. Jones’ Brigade, Department of Northern Virginia. The regiment disbanded in April 1862, with many of the men and officers joining other South Carolina regiments. Tudor Hall was the post office for Manassas. Plantation Collection. $450. 11-star flag patriotic (CC F11-73, CV $3,500 plus matching LS), handcarried to Joseph F. D. McGee, Goodman’s X Roads, Harris County, Geo. 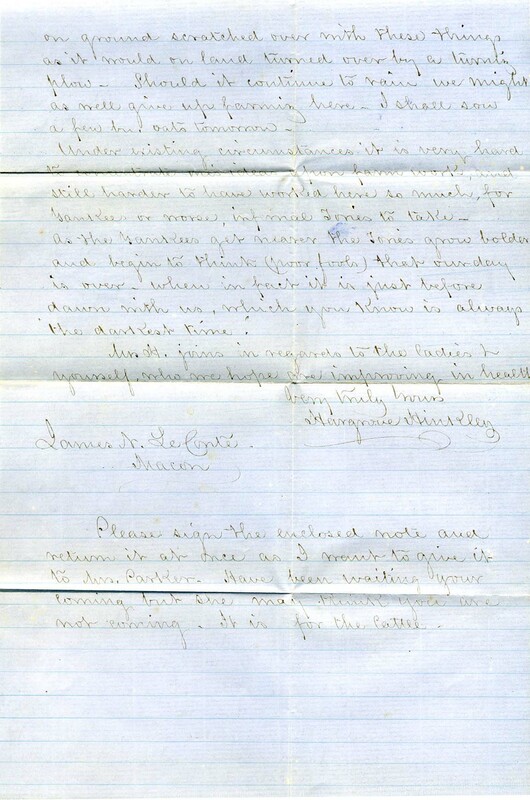 with matching lettersheet headed Camp Benning, Aug 29th 1861 to Joseph McGee from his father, Mark S. McGee. The letter is written as if talking to a very young boy, “I wish you were here a little while to see me and the soldiers our tents and the beautiful large town over yonder on the hill and the very high mountains that are close by us then I could see you hear you talk some and kiss my sweet baby but you are not here. I would like to have your degarotype (sic) to look at yours and mothers too. Be a smart and good boy son. Study your books and make haste to learn to write so you can write me a letter. Be a good boy mind your mother read the testament do not be naughty and everybody will like you” and more such fatherly wisdom and advice. He also describes camp life, “there are a great many soldiers here five or six regiments there are ten companies in a regiment and from sixty to one hundred and fourteen men in a company all of them have muskets and each company has twenty tents all made of w[h]ite cloth…there [are] 800 soldiers camped near us who muster on horseback the[y] are called cavalry there is a company here that has cannons on wheels like wagons and have horses to pull them.” And other descriptions fit for a young boy. Very showy matching patriotic set. Plantation Collection. $2,500. Marcus McGee served in Co. H, 17th Georgia Regiment, Toombs’ Brigade, 2nd Corps, Army of the Potomac and Dept. of Northern Virginia. More detailed information on linked page. 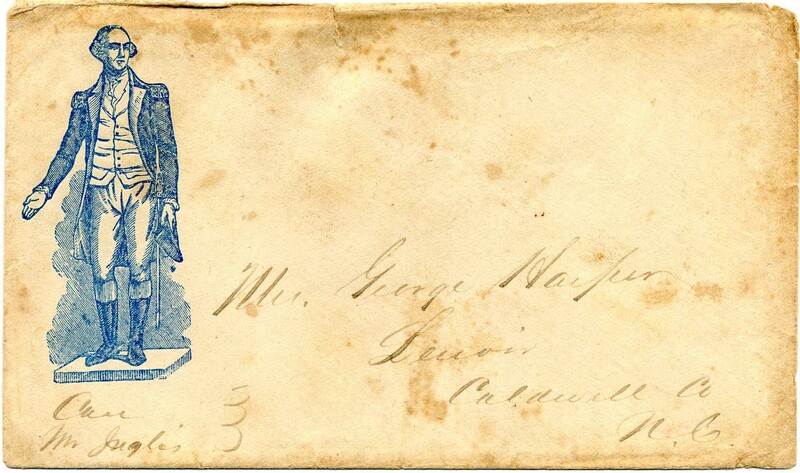 Hand-carried captured Union blue patriotic design of statue of George Washington, addressed to George Harper, Lenoir, N.C. Care Mr. Ingles with excellent original accompanying patriotic lettersheet of red design with slogans of Agriculture (showing plow and fields) and Commerce (showing steamship) headed “G. W. F. Harper, Camp near Big Creek Gap [Tenn] Tuesday, Oct. 28th, 1862” from soldier to his father saying, in part, “We left Cumberland Gap…& marched ten miles…& camped in in limestone sinks in a grove to shelter us from the wind…this is the nicest camp we’ve found yet…Hope no wagons have started from Caldwell to the Goose Creek Salt Works for salt as Gen. Bragg’s retreat from Ky. ill again place them in the hands of the Yankees. A considerable quantity was hauled through Gap before the evacuation of Ky…W.W. Bradshaw died…before we left Gap, of fever. We can do very well without Ike & don’t want him now.” Much more in four pages. Cover with back flap tear extending a bit over top of cover, bit of foxing. $550. George Washington Finley Harper served as Major in Co. H of 58th NC Partisan Rangers (Army of Tennessee) and Co. E 95th NC Militia. He was the assistant postmaster in Lenoir, NC. 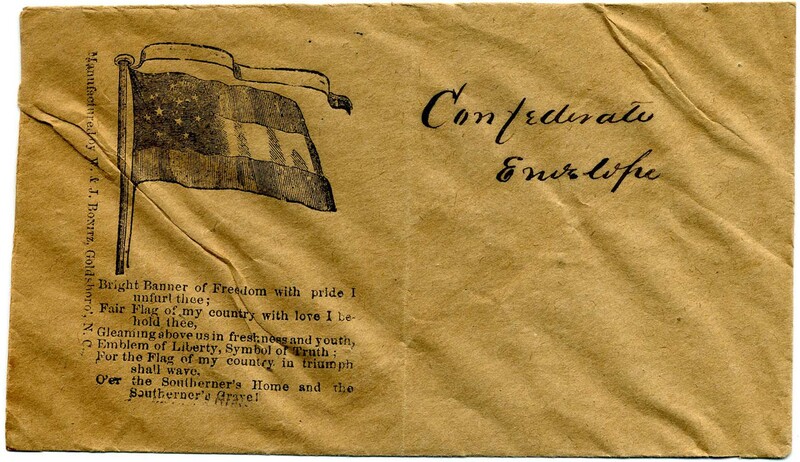 CSA 2-P, 10¢ blue Paterson print (mostly 4 margins) tied by WILMINGTON N.C. // 16 / DEC cds on 12-star Confederate Flag, Cannon and Verse Patriotic design (CC type CN-3), to Miss Mary E. Walker, Mount Pleasant NC. CCV $1,500 for design, SCV $2,250 for this issue on patriotic cover. 2008 CSA Certificate. $1,500. 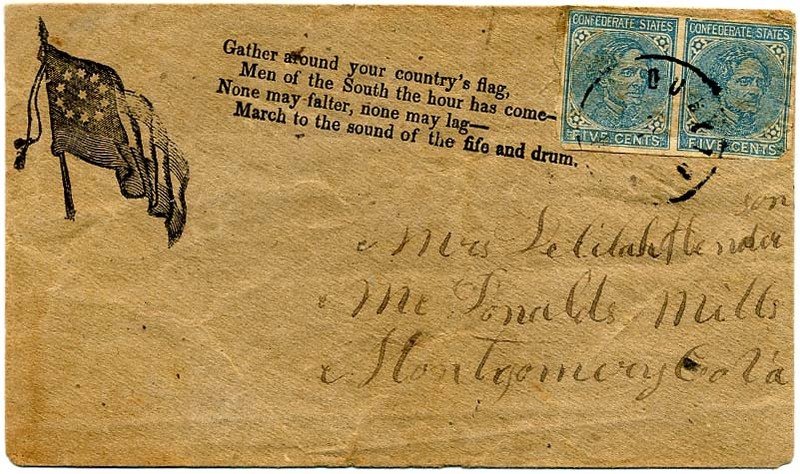 CSA 4, 5¢ blue, Stone 2, (4 margins) tied GOLDSBOROUGH / N.C. // APR / 10 /  cds on 12-star Confederate Flag, Cannon and Verse Patriotic design (CC type CN-3) with Bonitz imprint, addressed to Mollie Gordon, Clover Green, Va; small piece torn out at left and reattached, small tear at top, missing back flap, Very Fine appearance, CCV $1,500 for design, SCV $2,500 for this issue on patriotic cover. $750. 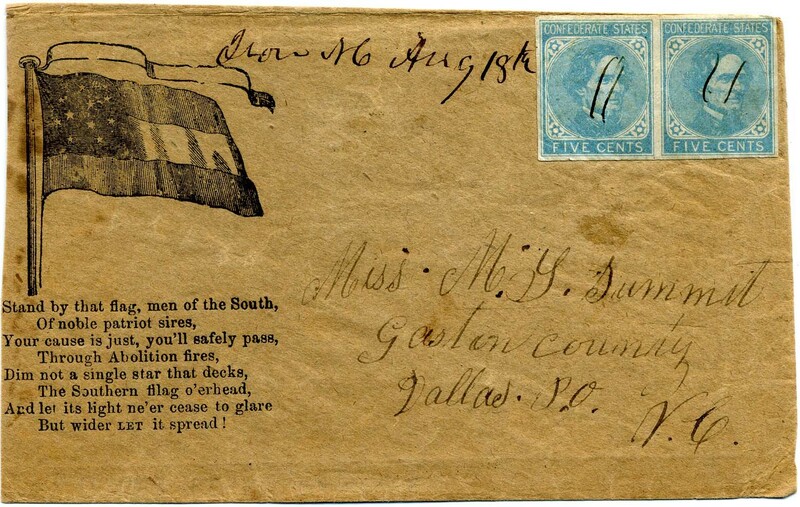 RALEIGH / N.C. // JUL / 15 / 1862 blue double circle datestamp and matching arced DUE 10 on 12-star Confederate Flag, Cannon and Verse Patriotic design (CC type CN-3, CCV $1,500), to Violet A. Sifford, Catawba Springs, N.C. with endorsement on verso from “Privet John F. Sifford, 52th Reg.t Com. G, NC Troops.” Missing top back flap, Ex Boshwit and Oswald. $700. John Frank Sifford served as a private in Company G, NC 52nd Infantry, Pettigrew’s Brigade. More information on linked page. 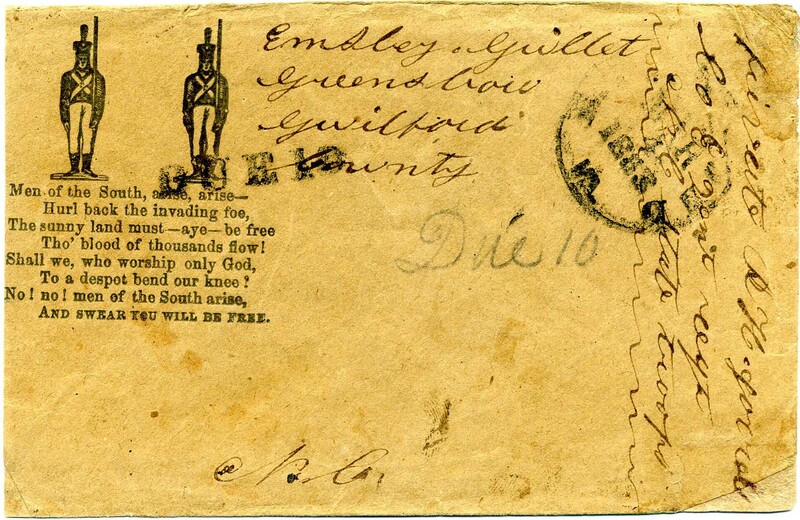 RICHMOND / VA. // MAR / 4 / 1863 cds with DUE 10 in both handstamp and manuscript, soldier's endorsement “Private R. H. Gorrell, Co. E, 2ent Regt NC State Troops,” to Emsley Guillet, Greensboro, Guilford County NC on brown cover to Greensboro N.C. with Two Continental Soldiers and "Men of the South, arise arise—“ Verse Patriotic design (CC type SN-1, CCV $2,000), slightly reduced at left but verse is complete, sealed top back flap tears, small restoration bottom right corner otherwise Very Fine, a RARE DESIGN. $850. 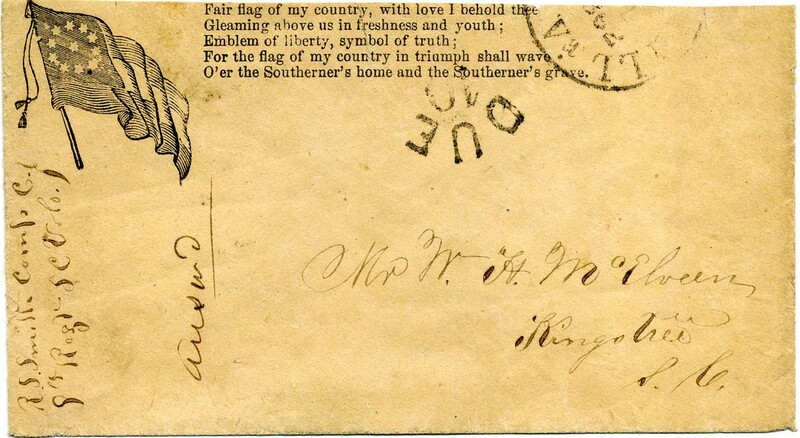 CSA 11, 10¢ blue (4 margins) just tied pen stroke with matching “Garysburg NC / Nov 10 ms. cancel on fresh 11-star flag patriotic (CC type F11-16, CV $750) to C. M. Phillipe, Boydton, Va. Ex Brian & Patricia Green. SCV $1,000. $700. WARRENTON / N.C. // JUL / 13 cds with matching PAID 10 on fresh Cannon and 12-star flag patriotic (CSA catalog type CN-3, CV $1,500), with Bonitz, Goldsboro, NC, imprint and “Bright Banner of Freedom” verse, to Berya Browning, Westland, N.C., Extremely Fine, Ex Judd and Oswald. $1,500. 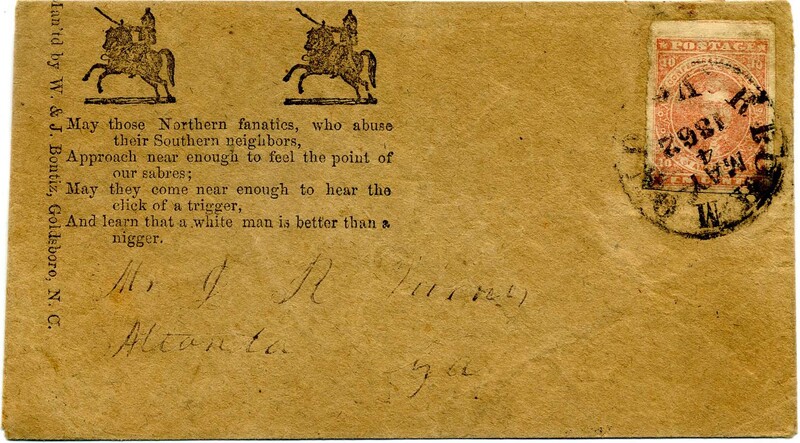 CSA 6, 5¢ light blue pair (tiny faults) tied by scarce “Elk Shoal N.C. / Decr 10th” manuscript cancel on Large Mounted Dragoon patriotic (CSA catalog type SM-1, CCV $1,000) with verse “To arms! 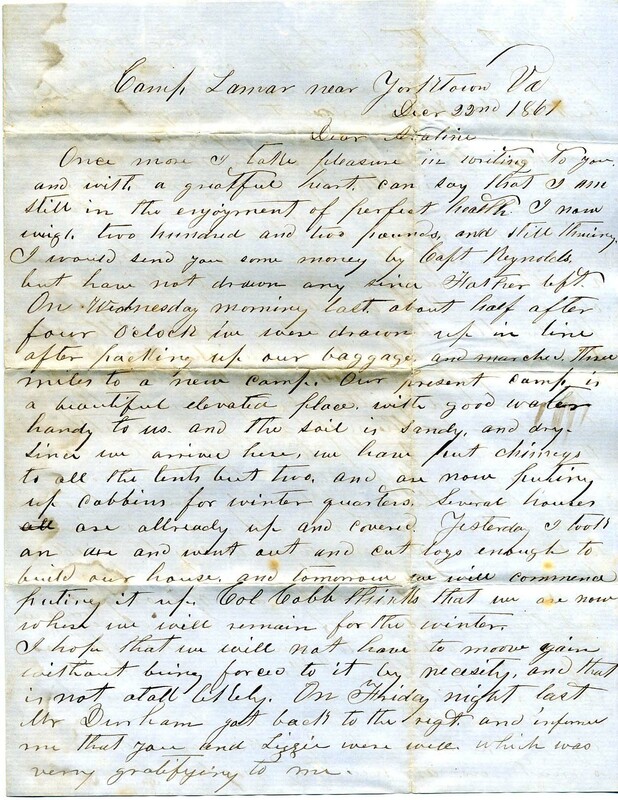 To arms quick, be ready,” to Mrs. Mary C. Frazier, Boonville, N.C. Nice amber envelope. SCV $1,250. $800. NEW BERNE N.C. // 5 PAID / FEB / 22  integral rate lightly struck blue cds (CC type B, CV $300 for just the marking) on Extended 10-star flag patriotic and banner (CC type F10-11, CCV $1,000) with Bonitz, Goldsboro, NC, imprint and “Bright Banner of Freedom” verse, to Miss Otetia Johnson, Louisburg, N Carolina, small tear at right top edge. $550. 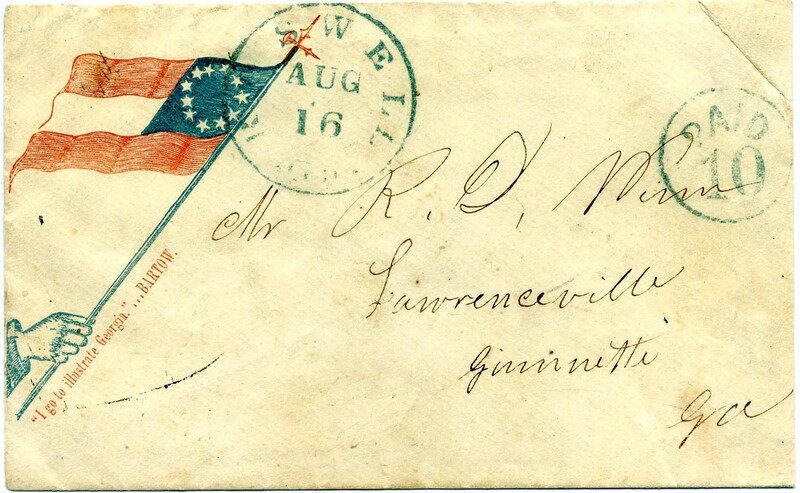 “Burgaw NC Feb 10” small town manuscript postmark with matching Due 10 on 11-star flag patriotic (CSA catalog type F11-16, CV $750), addressed in peacock blue ink to Miss Lavinia C. Michanor, Summerfield, Guilford, NC, endorsed by Private H. Crider, Comp. B, 27th Regt. N.C.T., slight staining. $450. Henry Crider, from Guilford County, was 27 years old when he mustered into Co. B, 27th NC Infantry. He was wounded at Sharpsburg, MD, on 9-17-62 and returned to duty in November. He was killed at Bristoe Station, VA, 1-14-63. 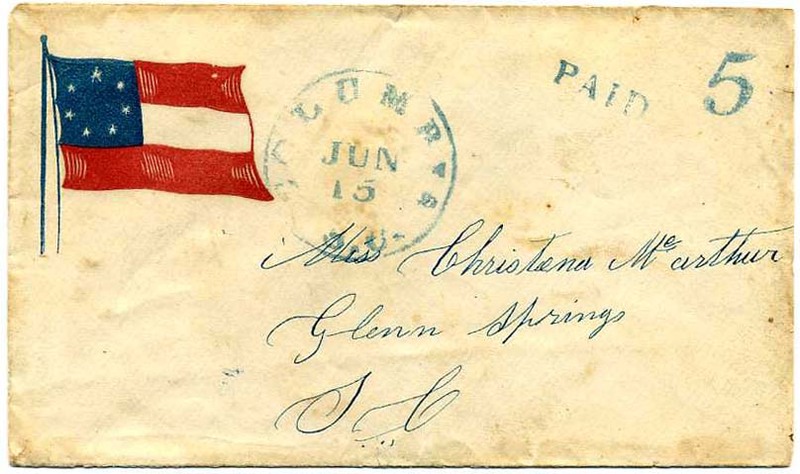 CSA 4-2, 5¢ blue, with irregularly torn margins, tied by blue RALEIGH / N.C. double circle datestamp and second neat strike at left on Extended 10-star flag patriotic and banner (CC type F10-11, CCV $1,000) with Bonitz, Goldsboro, NC, imprint and “Bright Banner of Freedom” verse, to Mrs. Jennette, Morven, N.C., slightly reduced at right into address, a bit war-weary with small edge tears. SCV $2,500. $600. 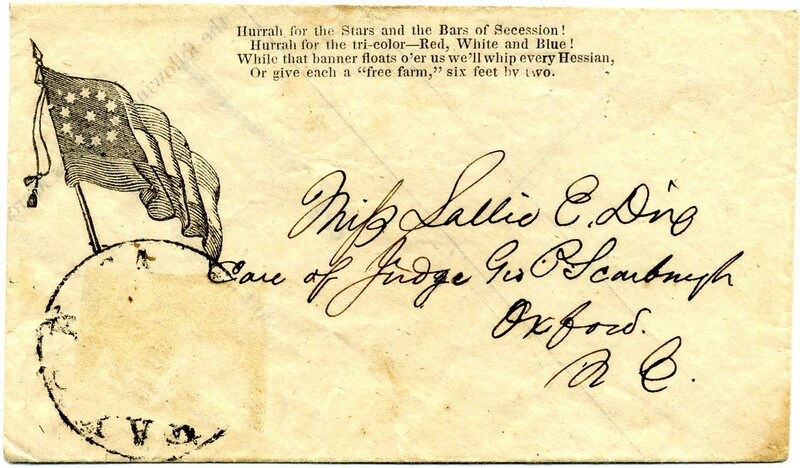 11-star flag patriotic (CSA catalog type F11-16, CV $750), addressed to Miss Sallie E. Dix, Care of Judge Geo. 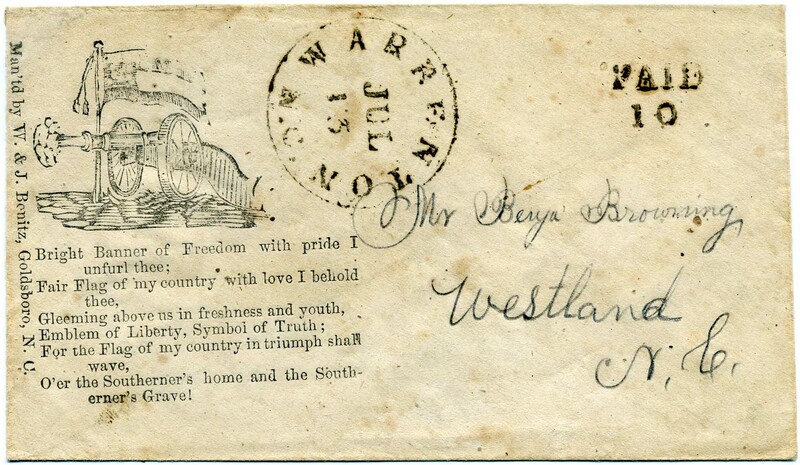 P. Scarborough, Oxford, N.C., with missing stamp and indecipherable cds at lower left, patriotic is also an adversity cover fashioned from an 1850s-dated printed form for “merchandize.” Fresh cover worth finding a stamp and restoring. $200. 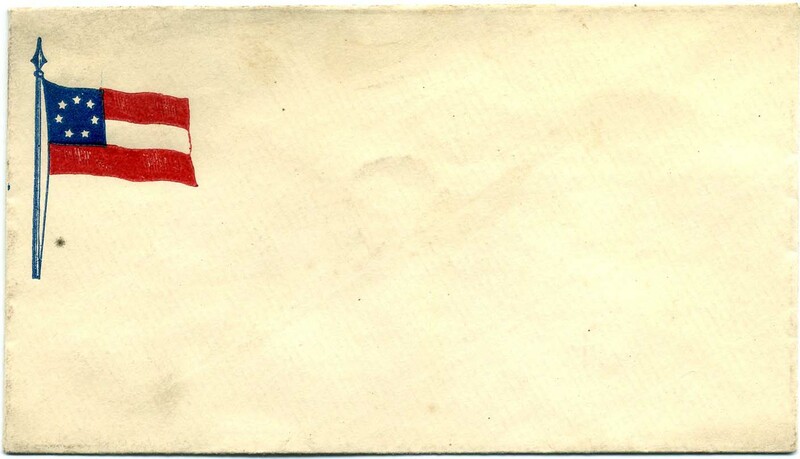 Unused Extended 10-star flag patriotic and banner (CC type F10-11, CCV as used $1,000) with Bonitz, Goldsboro, NC, imprint and “Bright Banner of Freedom” verse, with contemporary note “Confederate Envelope” – undoubtedly a Yankee souvenir. A bit rumpled but fresh and nice example. $150. 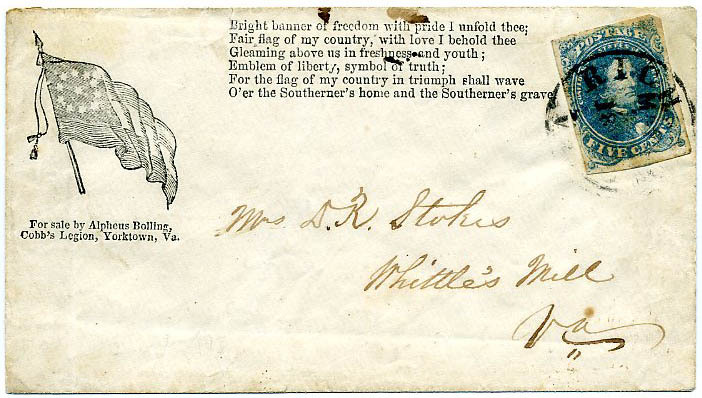 10-star flag patriotic (CSA catalog type F10-3, CV $1,000), with manuscript “Pd 5” but no town postmark, addressed to Miss Mattie Turner, Peters Creek PO, Patrick County, Va., slightly reduced at bottom. $400. 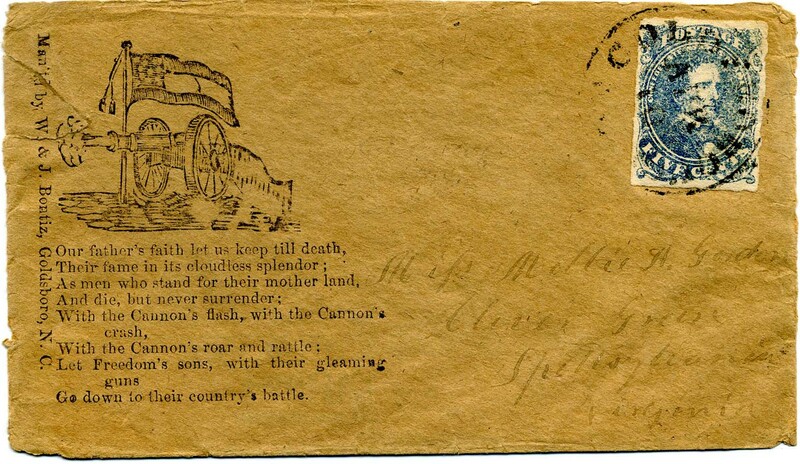 CSA 1, 5¢ green tied GORDONSVILLE / VA cds (faulty) used on Large Mounted Dragoon and Verse Patriotic cover (CC type SM-1) to Newton, N.C. Verse “To arms! to arms! quick, be ready…” and Forti et Fideli nil Difficile slogan, bit irregularly reduced at left, CCV $1,000 for patriotic design, SCV for this issue on patriotic cover $2,500. Ex Zimmerman and Katz. $600. Unused 11-star flag patriotic (CSA catalog type F11-3, CCV $3,500 when used), manufacturer imprint R. Coburn, Bookseller, N.O. (New Orleans), measures 6” x 3 3/8”, Very Fine. $200. 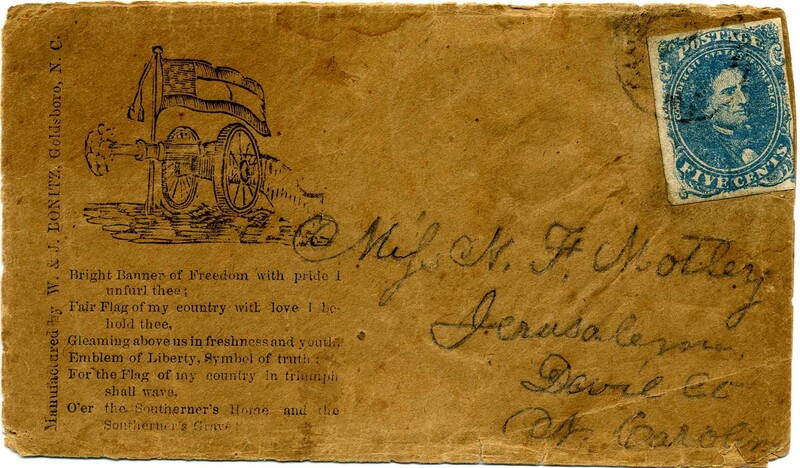 WINCHESTER / VA double-circle datestamp with matching DUE 10 on Large Mounted Dragoon and Verse Patriotic cover (CC type SM-1, CCV $1,000) to Jones Fuller, Louisburg, Franklin Co., NC with endorsement of J. B. Fuller, Private, Co. B, 11th Ala. Regt., horizontal crease, sealed flap tears and light soiling. $425. James B. Fuller enlisted as a private 6-6-61 in Co. B, Alabama 11th Infantry, Wilcox’s Brigade, Longstreet’s Division, Army of Northern Virginia; later transferred to Co. H. He was surrendered at Appomattox on 4-9-65. Unused C.S. 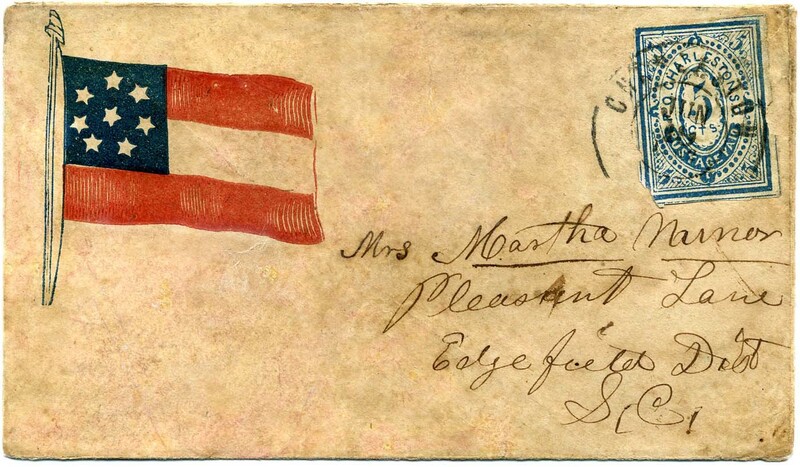 patriotic cover (CSA Catalog X-6) with imprint of New Orleans Envelope Deport, Corner White Street. 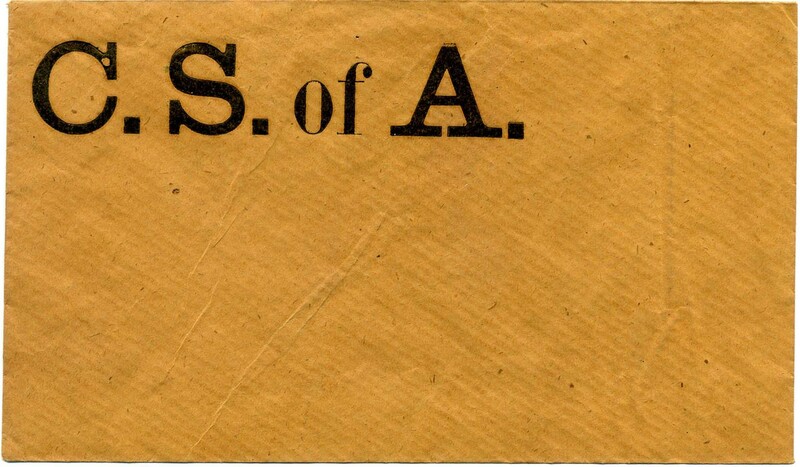 None recorded used, but undoubtedly of Confederate origin, 6” x 3 ¼”. The same with C.S.A. imprint is known used. Very Fine. $125. CSA 1, 5¢ green (faulty at upper left) tied grid cancel with matching light STAUNTON / Va. // JAN / 30  cds on 1860 BRECKENRIDGE AND LANE CAMPAIGN COVER with embossed imprints front “Constitutional Rights, Federal Protection in the Territories” and back flap “Hon. John Breckenridge of Kent for President; Hon. Joseph Lane of OR. 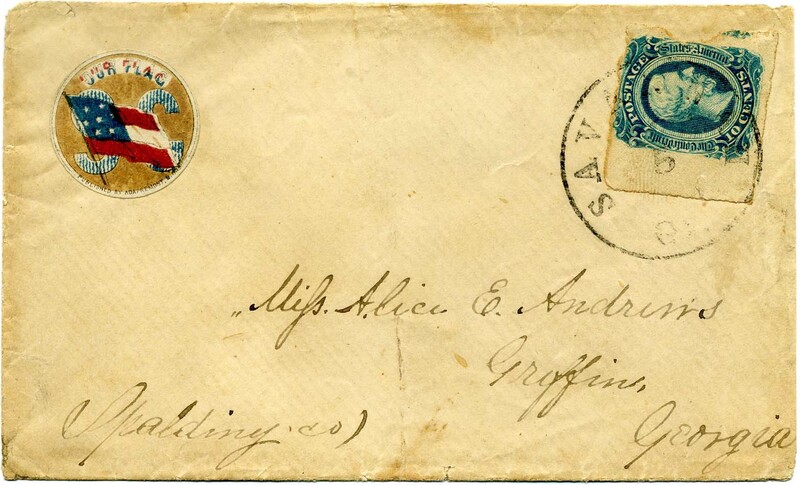 for V. Pres.” Addressed to Messrs AA & B Stuart, Selma, Allegeny (sic) County, Viga. 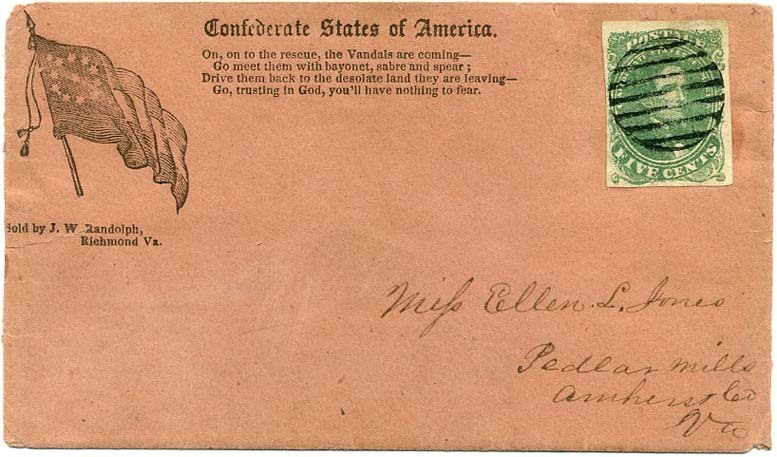 Rare Confederate use of 1860 campaign cover to / from the celebrated Stuart family. $950. ROSWELL / Ga. // AUG / 16 blue cds with matching handstamped PAID 10 in circle on 11-star flag patriotic (Dietz F11-9, slogan “I go to illustrate Georgia – Bartow,” CCV $1,500) addressed to “R. D. Winn, Lawrenceville, Gwinnett [County] Ga.,” cover repair at upper right and small reduction, 1991 CSA certificate #02227, Ex-Agre and Fisher, Rare design. $750. 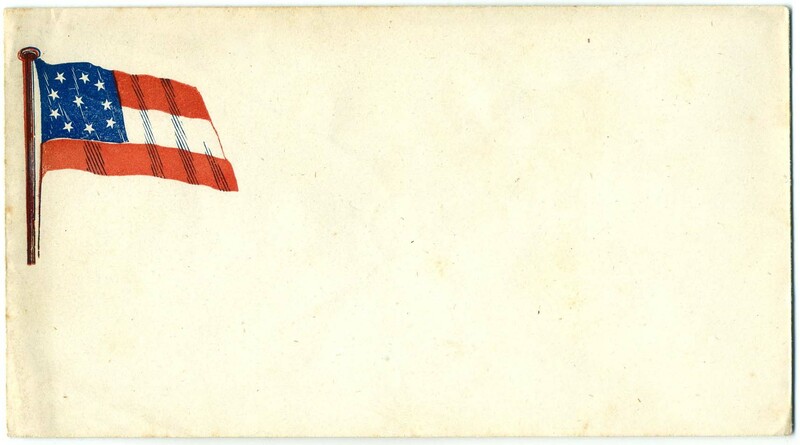 Unused 10-star flag patriotic cover listed in CSA catalog as Type X-4, which is almost the same as CSA catalog F10-17 which has a CCV $5,000 when used, 5 ½” x 3.” The only difference is the spearhead on the flagstaff in lieu of the ball. Although not known used, this rare design has all the hallmarks of a genuine Confederate manufactured product and is accepted by serious students. $300. 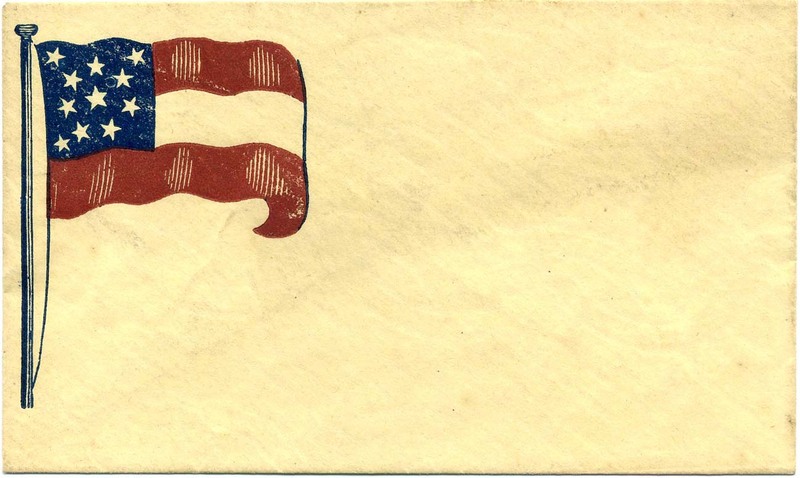 Unused 7-star flag patriotic cover (CSA catalog F7-4, CCV $1,000 when used), 5 1/2” x 3 1/8,” bit of light foxing at left with tiny stain. $90. 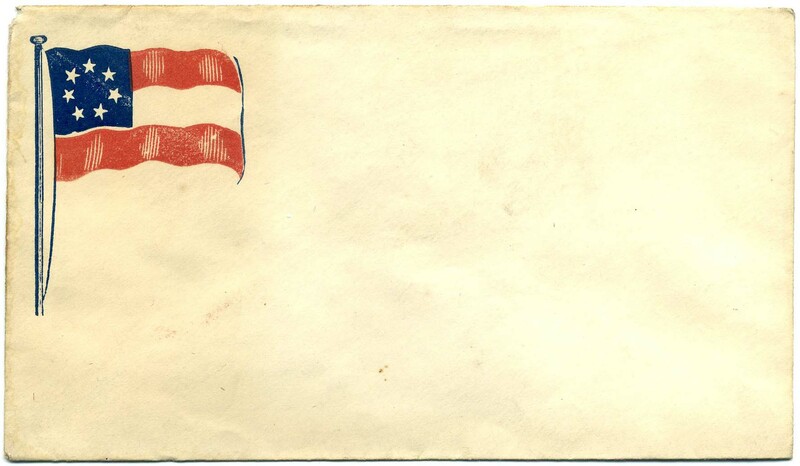 Unused large 7-star flag patriotic cover (CSA catalog F7-5B, CCV $5,000 when used), 5 7/8 x 3 3/8.” Tiny in consequential nick at upper left corner, Scarce. $275. 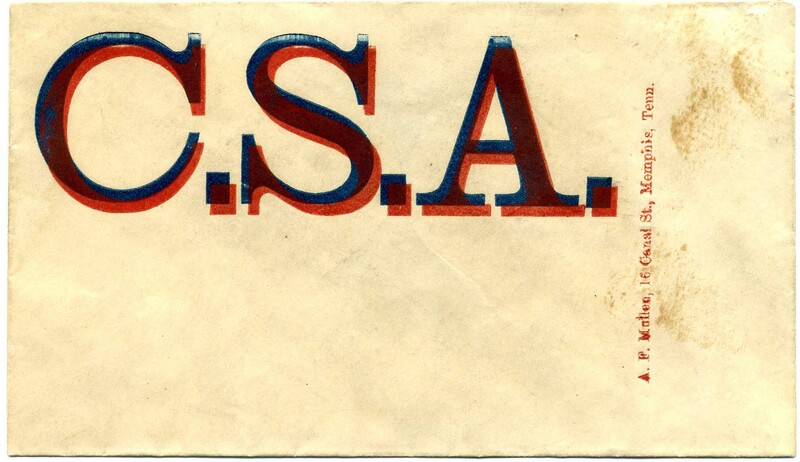 Unused large bi-colored “C.S.A.” in block letters with the imprint of “A. F. Mullen, 16 Canal St, Memphis, Tenn.” 5 3/8” x 3,” light staining at right. Not listed in CSA catalog but similar to other block letter patriotics. $75. 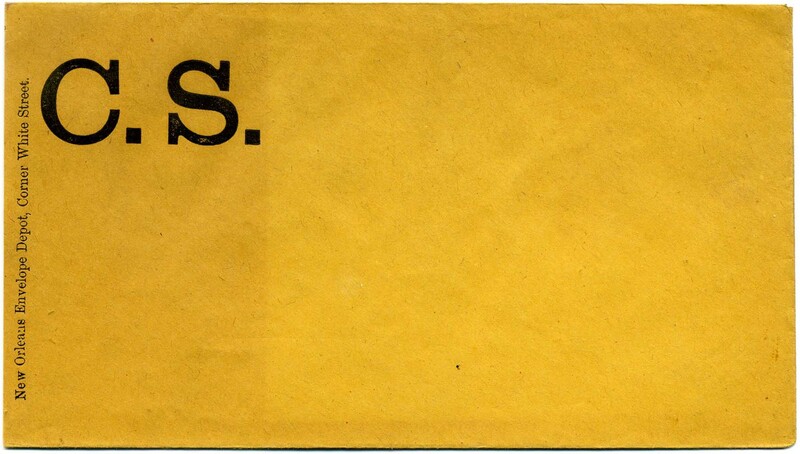 Unused “C.S.” patriotic cover with print in large block letters (CSA Catalog X-6) with imprint of New Orleans Envelope Depot, Corner White Street. 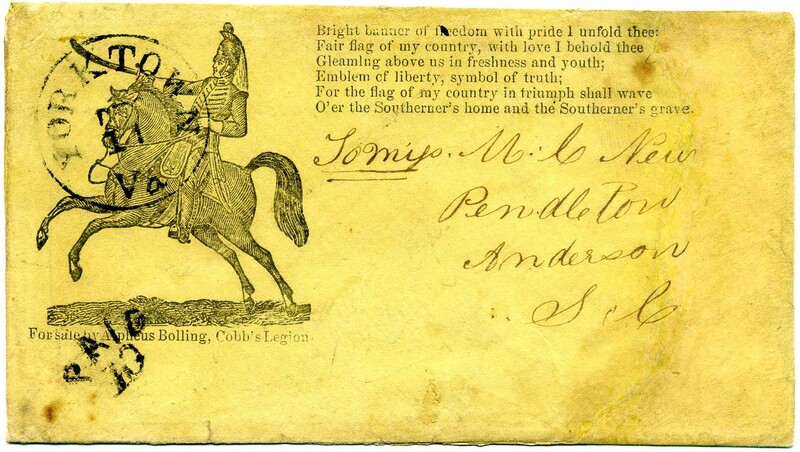 None recorded used, but undoubtedly of Confederate origin and accepted by current scholars, 5 7/8” x 3 ¼”. The same with C.S.A. imprint is known used. Very Fine. $125. 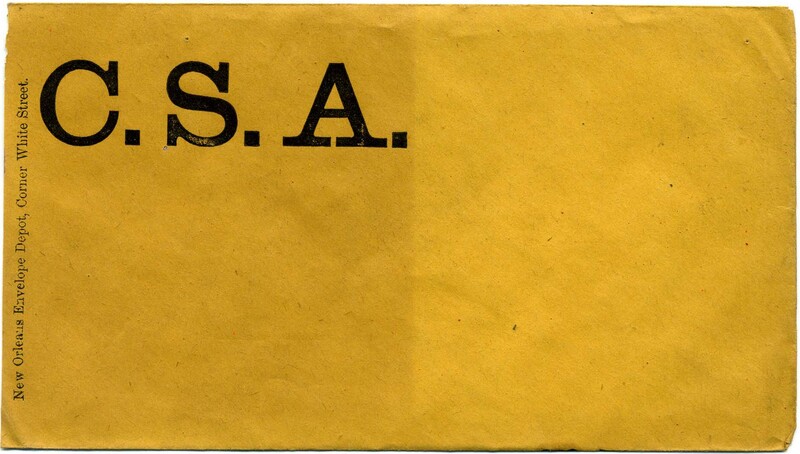 Unused “C.S.A.” patriotic cover with print in large block letters (CSA Catalog PS-5, CCV $2,500 when used) with imprint of New Orleans Envelope Depot, Corner White Street, 5 7/8” x 3 ¼”. The same with C.S.A. imprint is known used. Very Fine. $150. 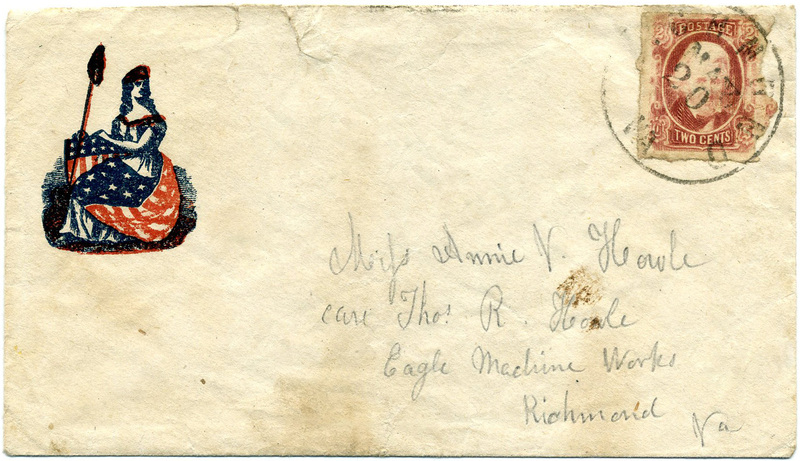 CSA 8, 2¢ brown red tied RICHMOND / VA. // MAY / 20 cds on Northern Patriotic of Liberty and Shield design, stamp roughly separated at right, flap faults, some small sealed tears of which extend over the top edge, signed “OK / Dietz” on verso, addressed to “Miss Annie V. Howle, Care Thomas R. Howle, Eagle Machine Works, Richmond, Va.” Ex Dr. Griffin Frazier (1957), Morris Everett (1993) and Haub, 1977 CSA Certificate. $3,000. 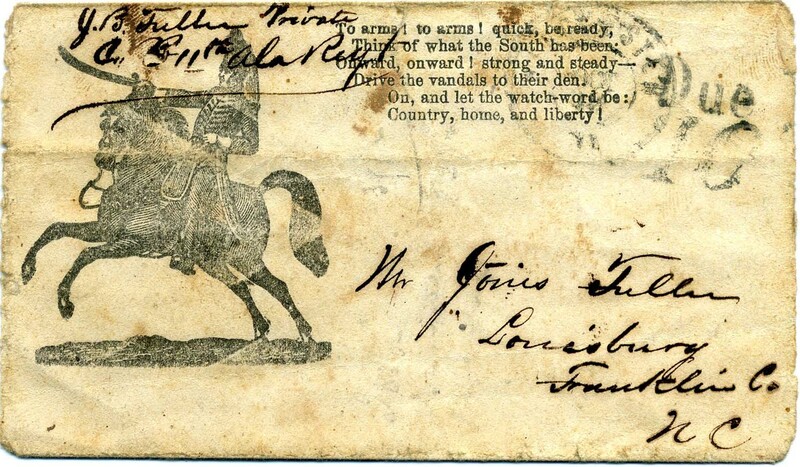 CSA 1, 5¢ green tied double strike of TUDOR HALL / VA. // FEB / 5 / 1862 cds on 11-star waving flag patriotic (CSA catalog type F11-16, imprint type 31 “Sold by J. W. Randolph, Richmond, Va.,” verse type 30; SCV for CSA 1 on any cover is $2,500), to “Miss Rebecca Hamilton, Tinker Knob, Botetourt County, Va.” Slightly reduced at top and part of flap missing. Scarce use of lithograph on patriotic. $1,800. CSA 4, 5¢ blue tied somewhat indistinct PRINCE EDWARD C.H. 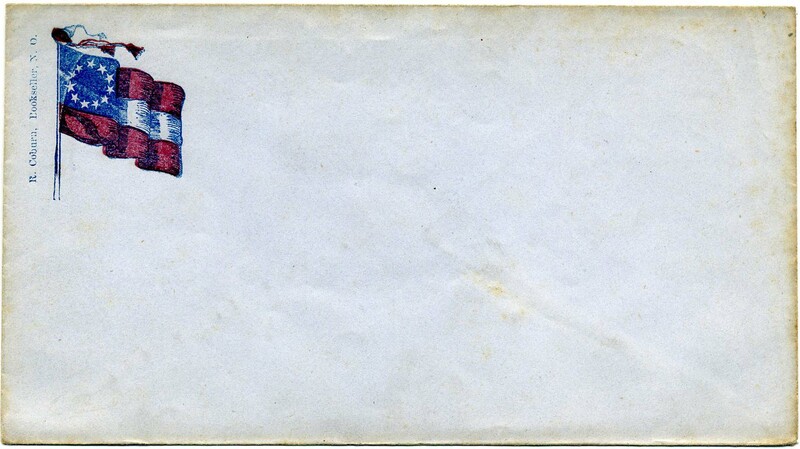 / Va. tied 36 mm BALLOON postmark on Cannon and 12-star flag patriotic (CSA catalog type CN-1C, SCV $2,500) with Alpheus Bolling, Yorktown, Va. imprint, addressed to Mrs. T. W. Sydnor, Blacks & Whites, Nottoway [Va], 1975 APS certificate. Scarce use of lithograph on patriotic. $2,000. Dr. J. W. Hunter was a dental surgeon. During the war, he was subjected to the requirements of the NC conscript laws and ordered into service. He claimed exemption and the NC Supreme Court decided in his favor. 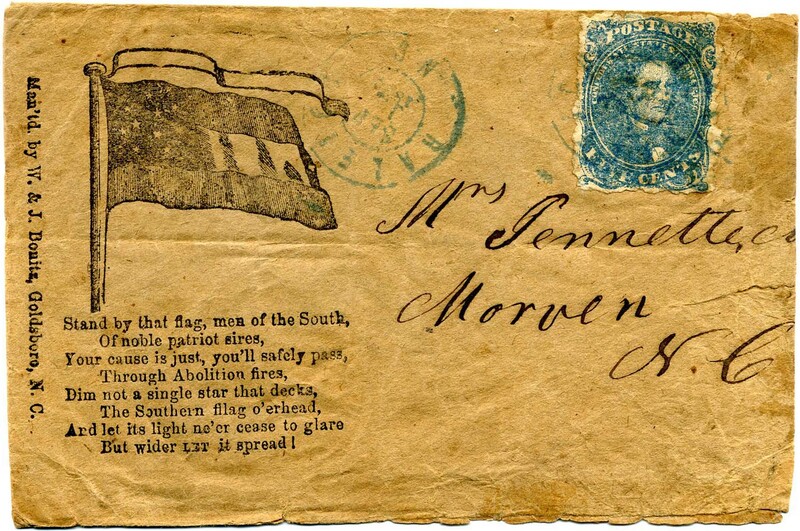 CSA 6, 5¢ light blue pair (bit of corner creasing on left stamp) used with manuscript cancel of “Iron, NC, Aug 18th” on 10-star waving flag / banner patriotic cover (CSA Catalog type F10-11, verse 37, CCV $1,000) to Miss M. Y. Summit, Dallas PO N.C., slightly reduced at left and few toned spots at left. SCV $1,200. Ex Oswald. $650. CSA 12-AD, 10¢ blue (roughly separated) tied by 7-bar unenclosed 20 mm Army of Northern Virginia field cancel (CSA catalog type ANV-07) used on Howell’s Poems Union Patriotic “Brothers Be True” with verse “And when rebellion is put down” with “rebellion” changed to “abolition.” A captured Union Patriotic, tiny edge tears and part of top back flap missing. 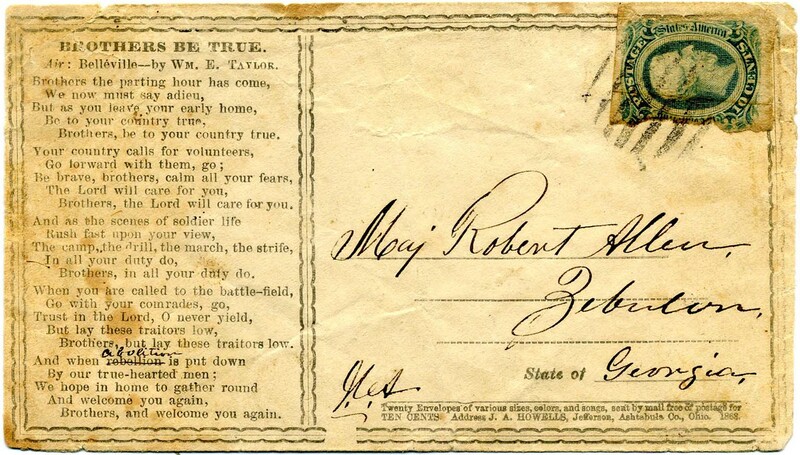 Addressed to Maj. Robert Allen, Zebulon, Georgia, whose military title is not Confederate; he was a prominent citizen and veteran of War of 1812 and Indian Wars. Ex Fisher. $550. Frank H. Hannum served in Company K, 61st Tennessee Mounted Infantry. 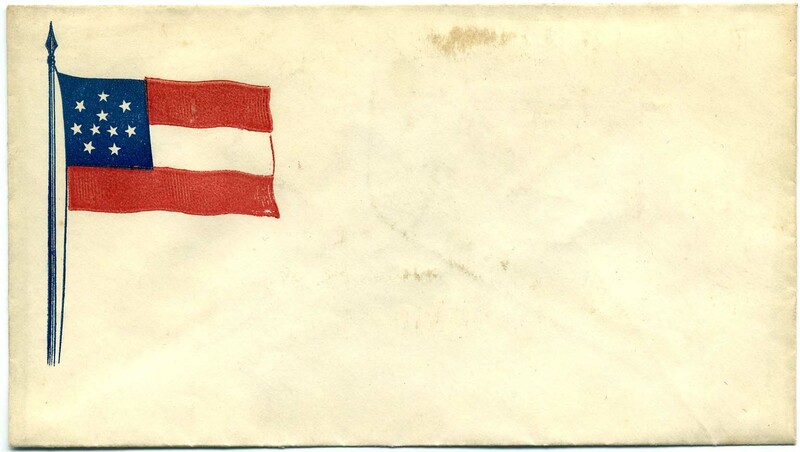 Unused 10-star flag patriotic, not recorded in CSA catalog as postally used. Could be post-war production. Cannot be considered a genuine CSA production until found postally used, Very Fine. $90. Soldier’s DUE 10 used with indistinct Georgia CDS on small narrow Gen. G.T. Beauregard medallion patriotic (CSA catalog type MS-1 in red, CCV $2,500), addressed to “Jno R. West, Hog Mountain, Georgia” and endorsed “from [3rd Sergeant] R[obert] P. West, 35th Regiment Georgia Vols.” (Company H). This was A.P. Hill’s Army of Northern Virginia. West was killed in action May 1864 at Jericho Ford, Va., there were estimated battle casualties of 4,000 on both sides. Ex Agre, 1991 CSA certificate. $1,400. 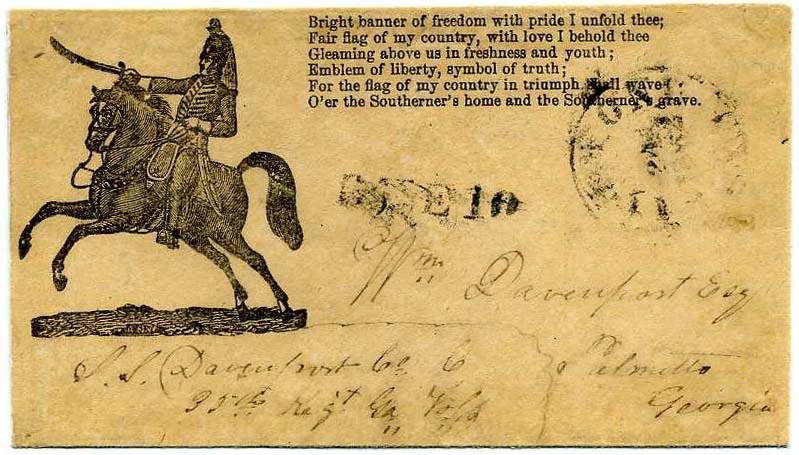 RICHMOND / Va. cds with matching handstamped straightline DUE 10 on Mounted Dragoon patriotic, CC type SM-1 with “Bright banner of freedom with pride I unfurl thee…” verse, addressed to Wm Davenport, Esq, Palmetto, Georgia, endorsed by J. S. Davenport, Co C 35th Regt Ga Vols., lightly cleaned and restored. CCV $1,000. $500. Small Extended Waving 11-Star Flag with Tassels on Flagstaff (CC F11-3, imprint 23, CV $3,500 when used), unused with imprint “R. Coburn, Bookseller, N.O.” $200. Waving 11-star flag similar to F10-15 (CV $7,500 used), unused. 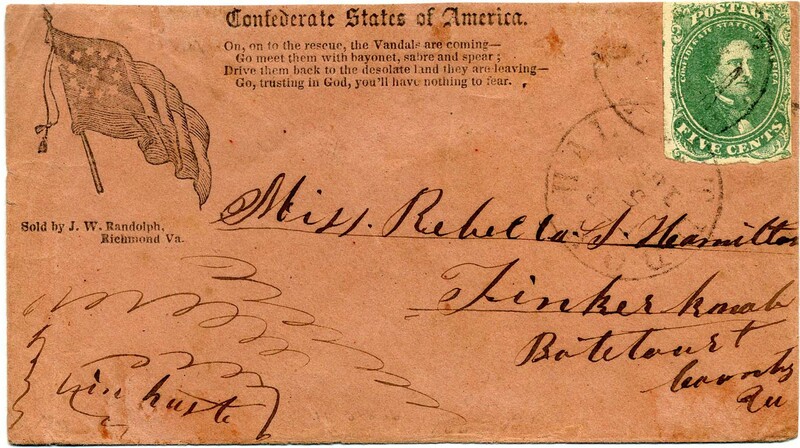 By design appearance and style, this is likely of Confederate origin but no corresponding postal or lettersheet use has yet been documented. $125. 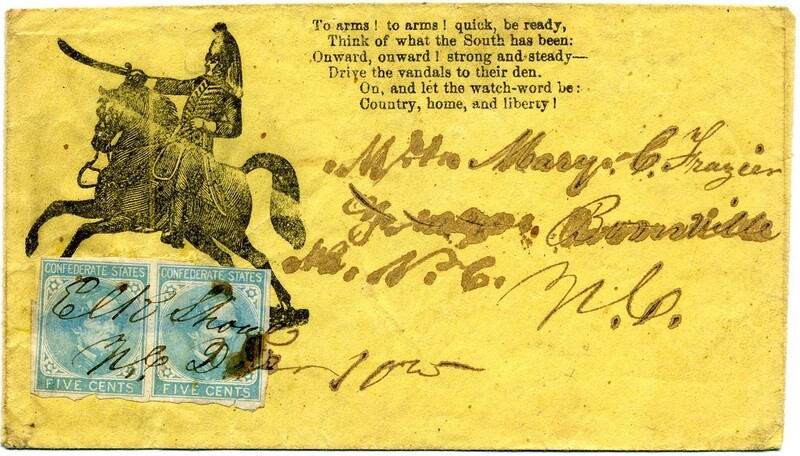 CSA 5, 10¢ rose (4 clear to huge margins), tied RICHMOND / Va. // MAY / 4 / 1862 cds on Small Mounted Dragoons patriotic cover (SM-2, Verse 24, Imprint 17) to Mr. J. R. Turner, Atlanta, Ga., with imprint “Man’td by W. & J. Bonitz, Goldsboro, N.C.” With 2001 PSE certificate, which does not mention crease at LL on stamp. Scarce with this issue on a patriotic. Ex Kilbourne. SCV $3,000. $2,300. 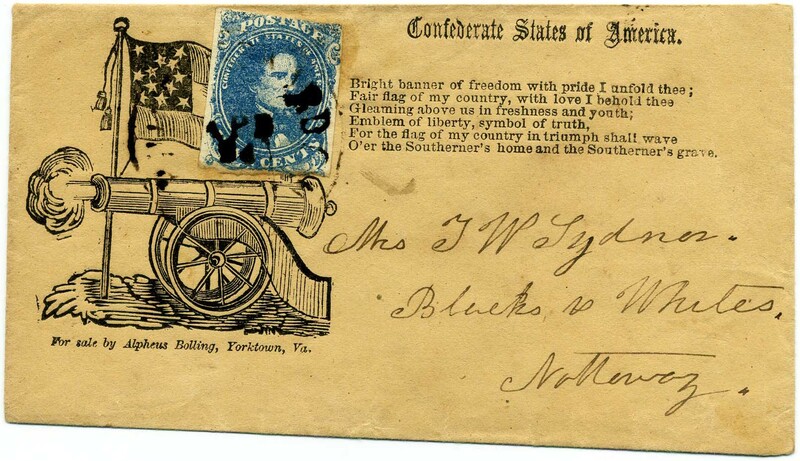 CSA 4-2, 5¢ blue, Stone 2, position 41 (3 margins) stamp added to Cannon and 12-star flag patriotic (CSA catalog type CN-3, CV $1,500), with Bonitz, Goldsboro, NC, imprint and “Bright Banner of Freedom” verse, to Miss N. F. Motley, Jerusalem, N. C., open 3 sides and remaining side strengthened with archival tape from inside, bit reduced at right and bit edge worn, stamp plated (signed) by LHH (Hartmann), Ex Hart. $300. 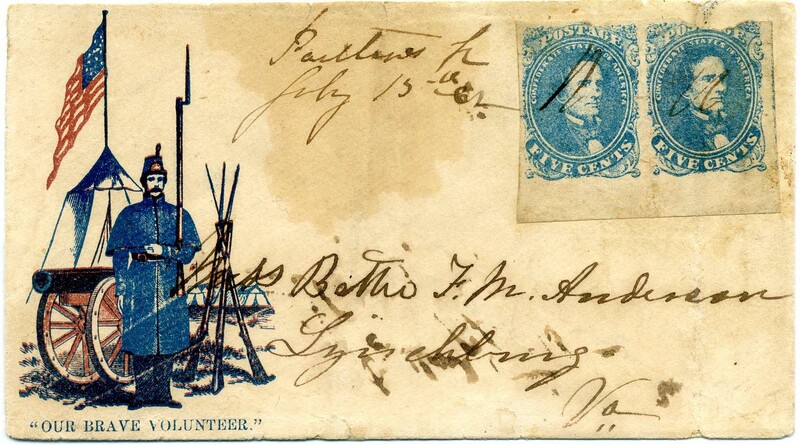 CSA 4, 5¢ light blue horizontal bottom sheet margin pair, (couple nicks at top) with unidentified manuscript postmark purported to be "Portland [West] Va, July 15th - 62" (I don’t believe the ID) on Captured United States Patriotic "Our Brave Volunteer," postmark barely ties, matching squiggles cancel stamps, to Miss Bettie F. M. Anderson, Lynchburg, Va., no back flap and staining, pair moved from upper edge. Good research project. $650.